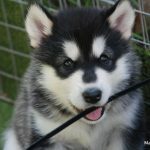 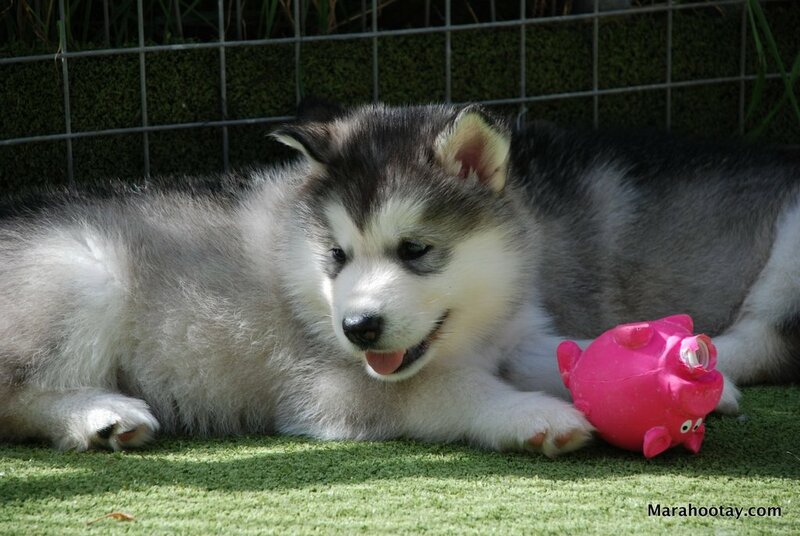 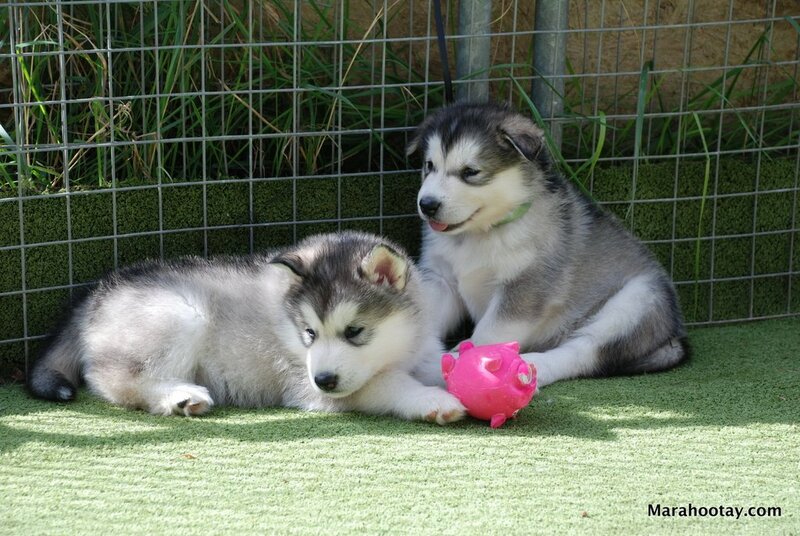 Marahootay is pleased to announce the arrival of our?Hades x Effie litter, born 6th August. 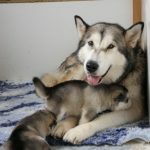 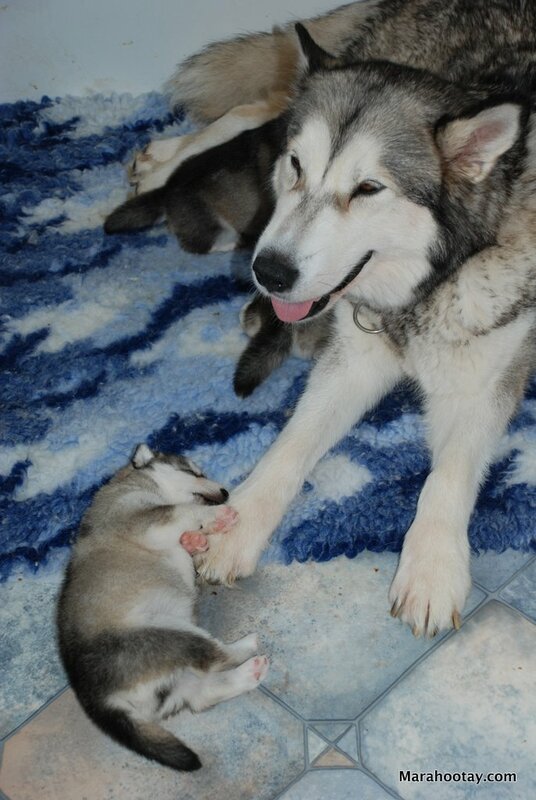 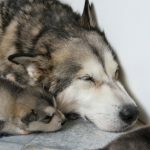 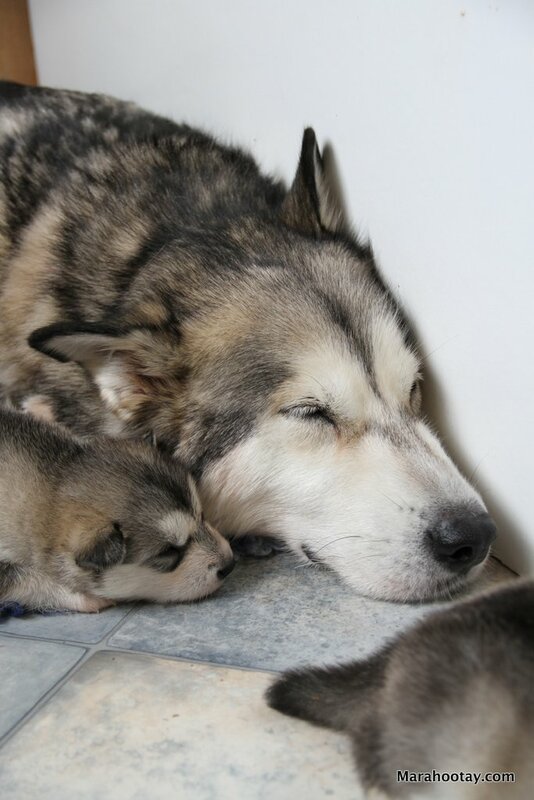 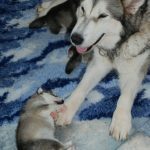 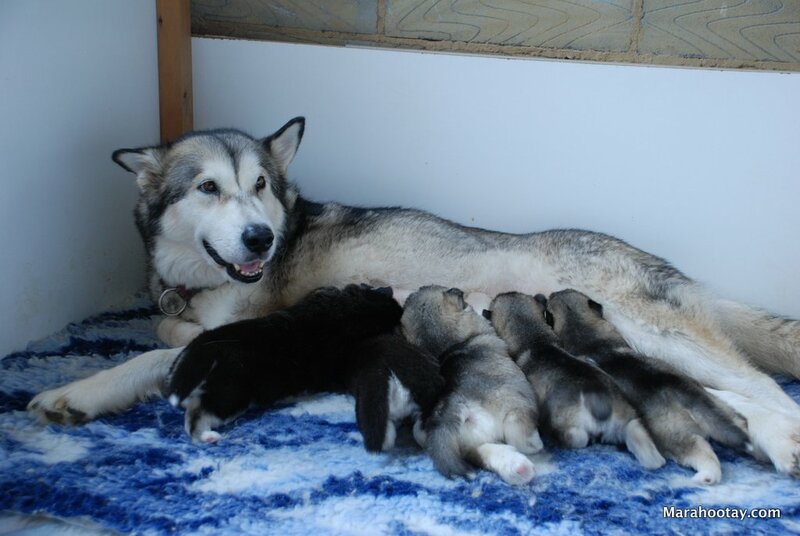 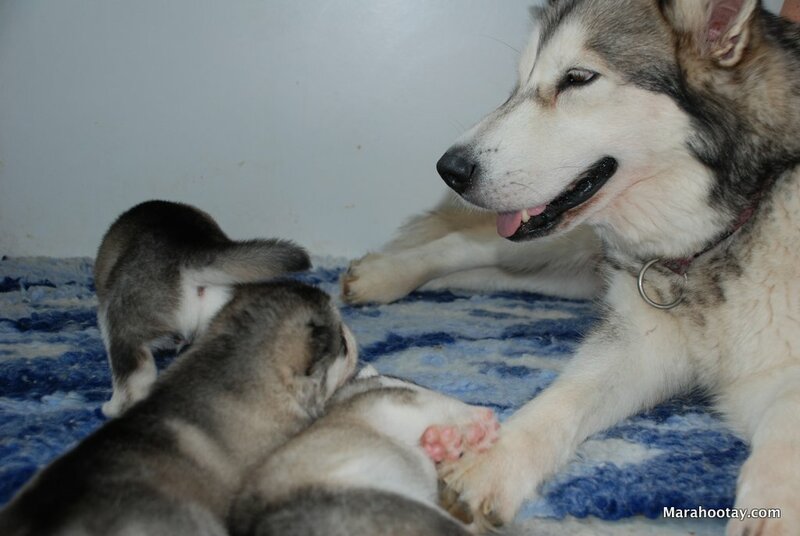 Mother and puppies are all doing well. 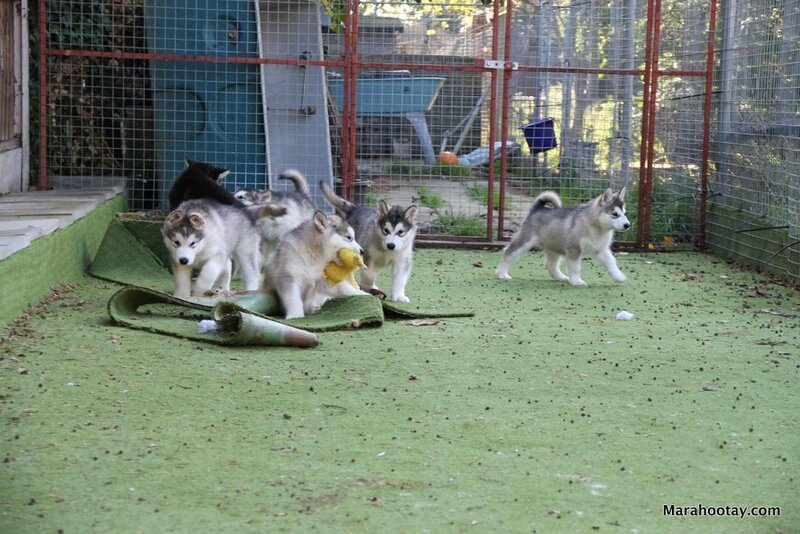 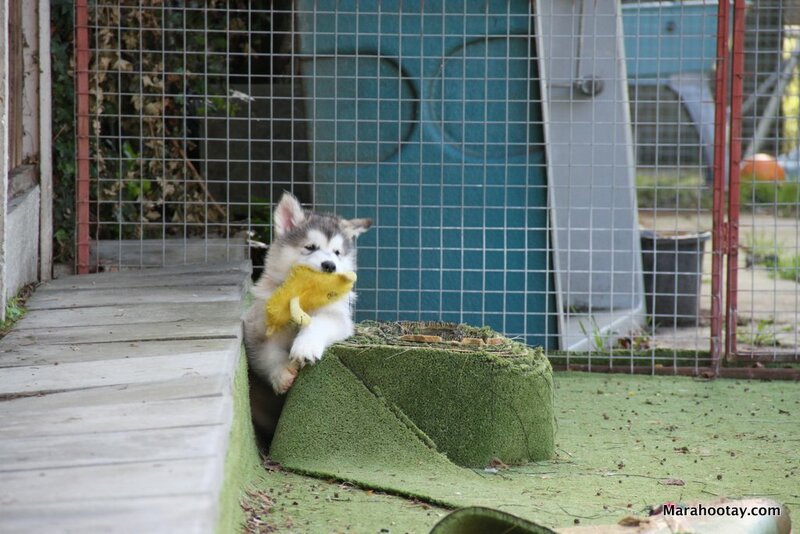 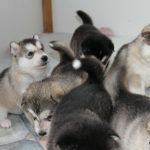 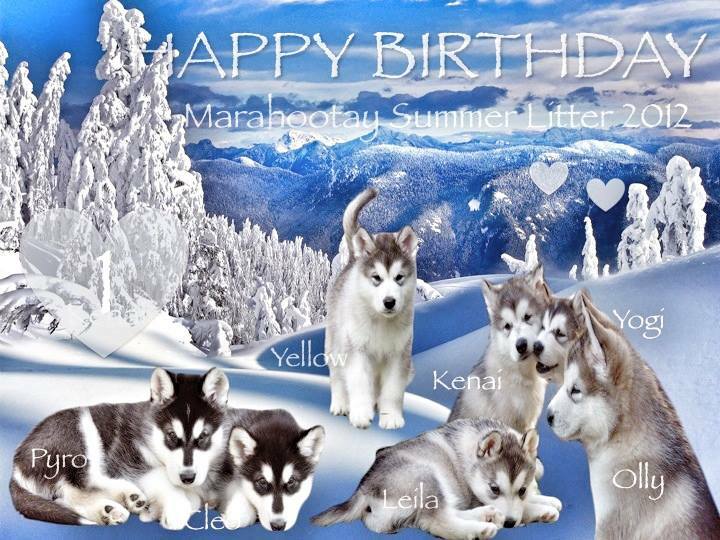 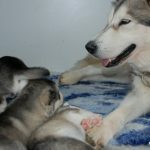 Litter consists of 5 males (4 grey/white 1 black/white) and 2 females (1grey/white 1 black/white). 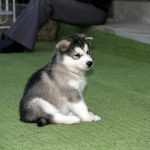 This breeding combines the best of two exceptional lines and is a repeat breeding which produced the likes of Sultan (Marahootay Prince of Persia) and Pink (Marahootay Desert Orchid). 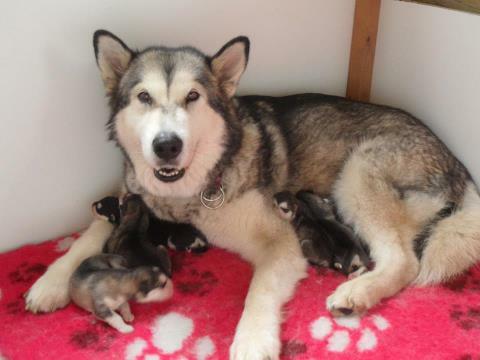 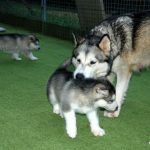 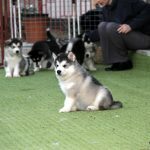 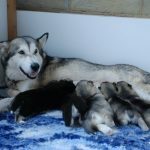 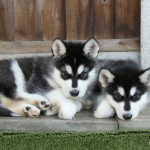 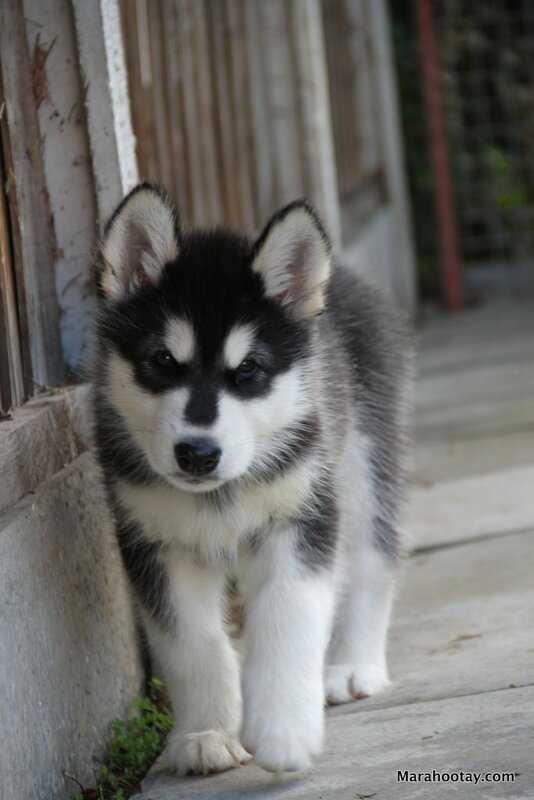 Click here to view the five generation pedigree for this litter. 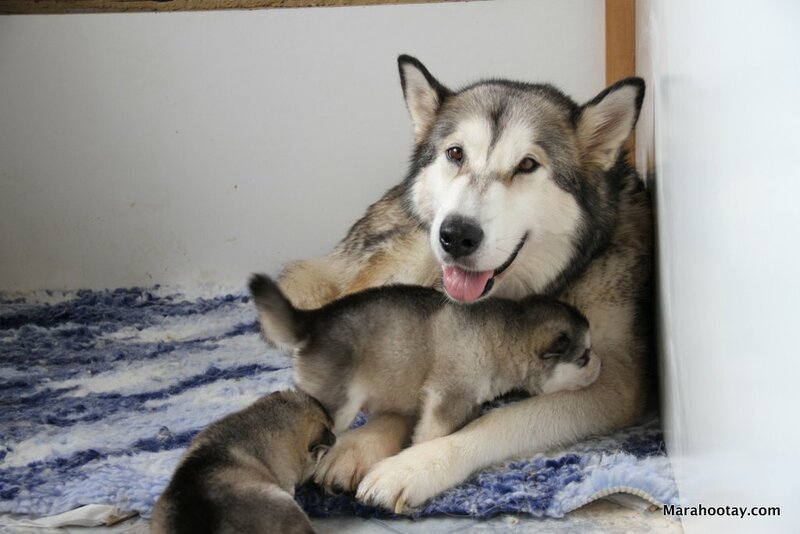 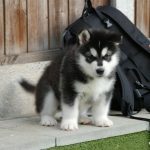 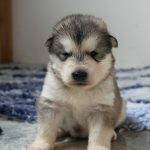 Effie (Kasaan’s Forever Fortune) goes back to Granite Ch Terrapines Kasaan N Stone ROM who last year at the Nationals won Best Veteran in the Sweepstakes and then went on to be awarded an Award of Merit at the Regional and one of her Grandfathers is Viking (Storm Kloud’s Vvanilla Snowman).? 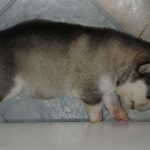 Effie has fabulous bone and huge feet, dark almond eyes and the most awesome gait you will see, she seems to float over the ground.? 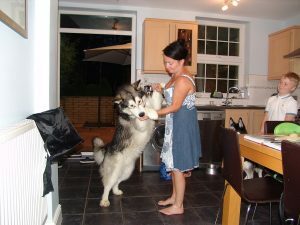 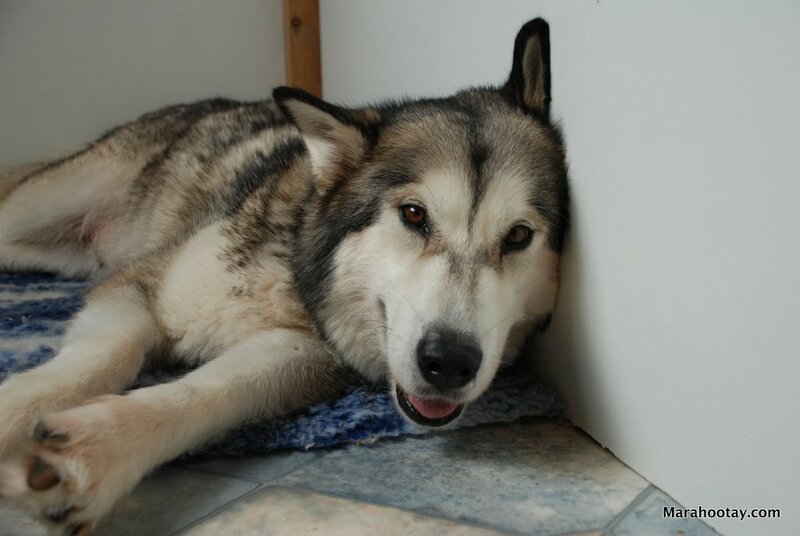 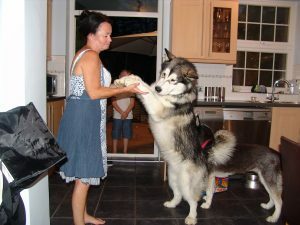 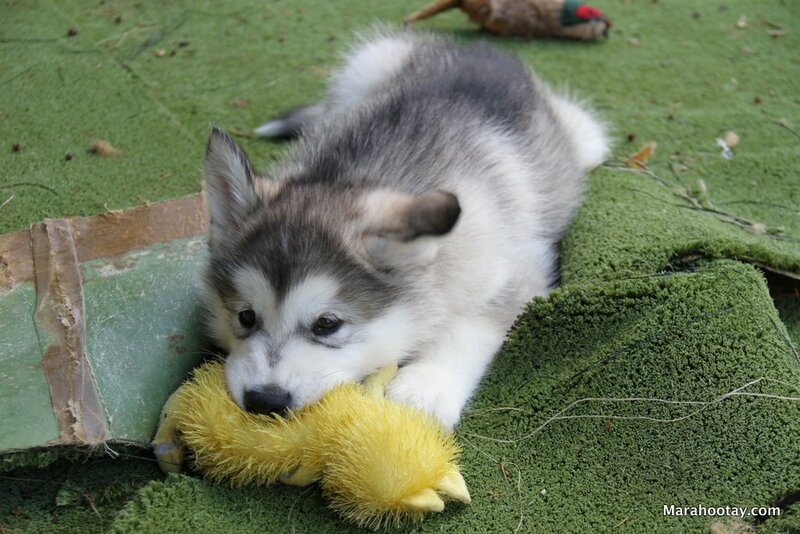 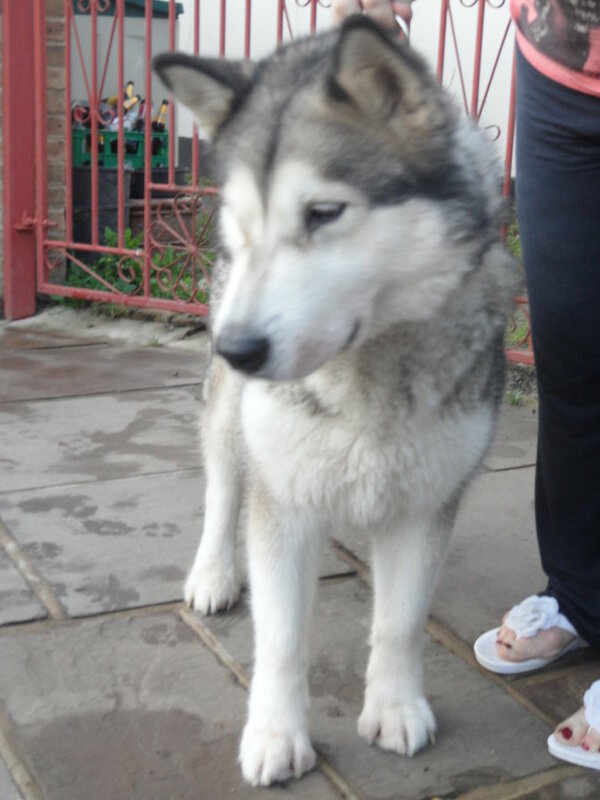 To quote her Breeder Bonnie “Effie has gorgeous breed type, angles and has the most loving temperament. 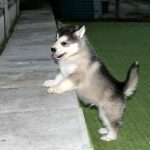 She has incredible side gait, huge feet and bone with awesome dark almond shaped eyes.? 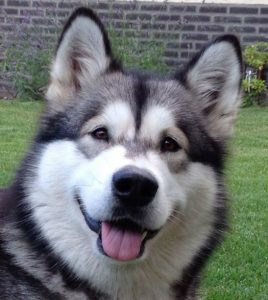 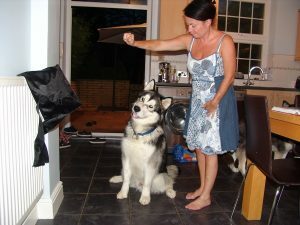 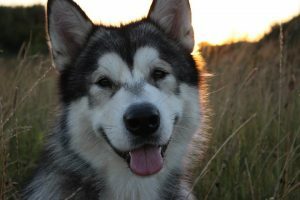 Hades (Stormchaser Prince of Darkness) is an International Champion and a Champion in America, Nederlands, Germany, VDH, Luxembourg and Slovakia and is one point short of his Belgium Title. 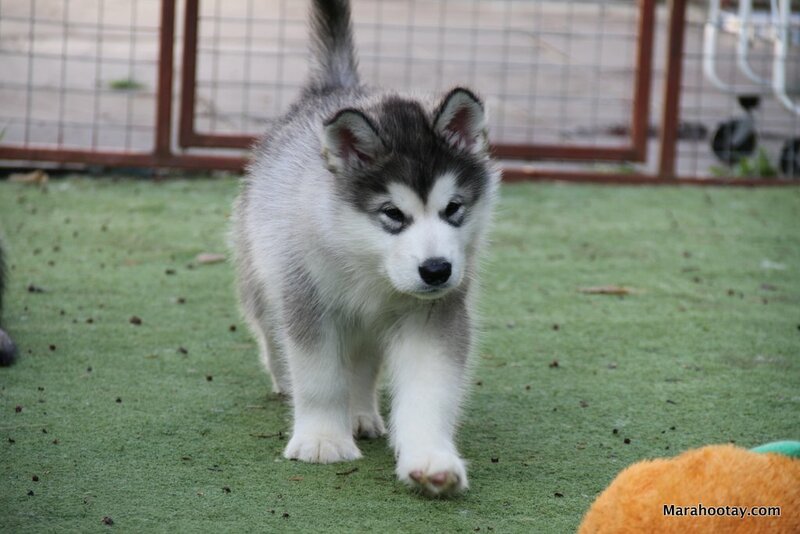 Walking in the footsteps of his two older brothers King and Phantom and definitely following in the footsteps of his wonderful Father Seven (Windchaser’s Seventh Son) who are all international champions.? 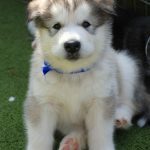 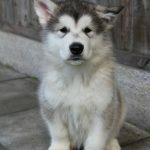 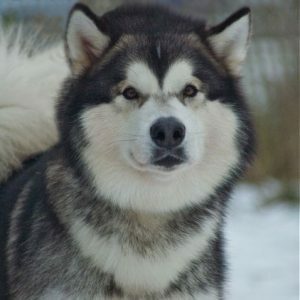 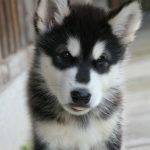 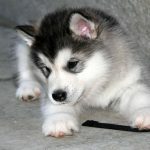 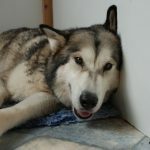 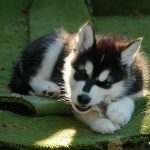 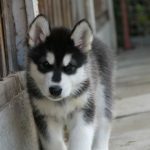 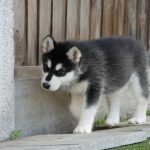 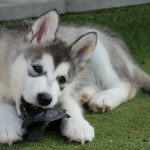 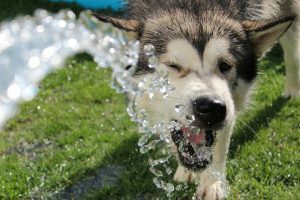 He has a huge heart and a great sense of fun and is a joy to have and love, he has beautiful movement, a wonderful coat and breed type of strength coupled with a gentle face.? 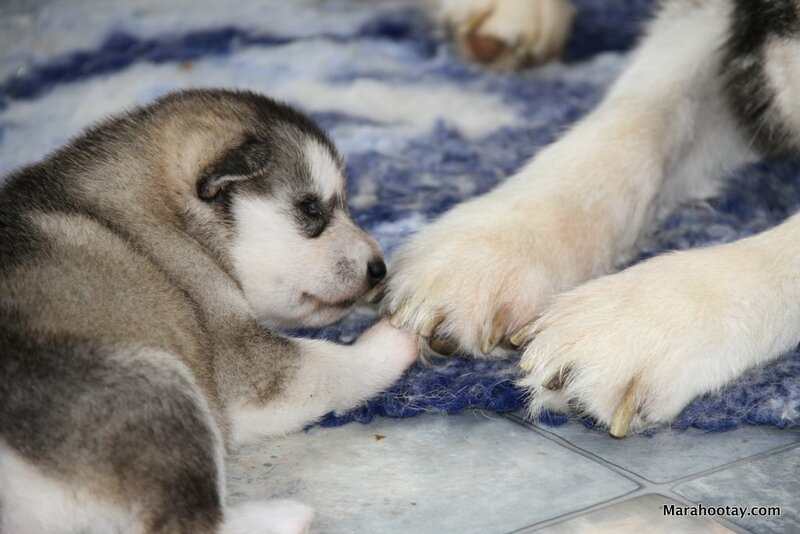 He has plenty of bone with lovely big feet.? 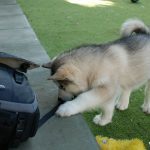 Hades loves to work taking the lead pulling John round on the rig and you can hear his excited barks when he spots a team in front telling John and the team he is working with that it’s time to pick up the pace and catch them ! 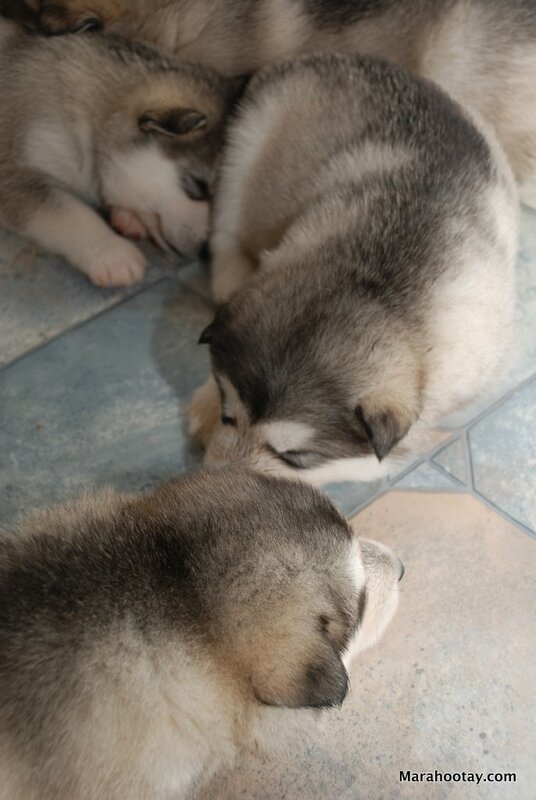 Both parents have current eye tests – clear. 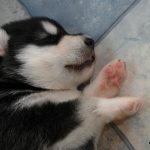 Hades’ hip score 4 + 4 = 8. 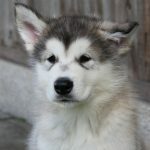 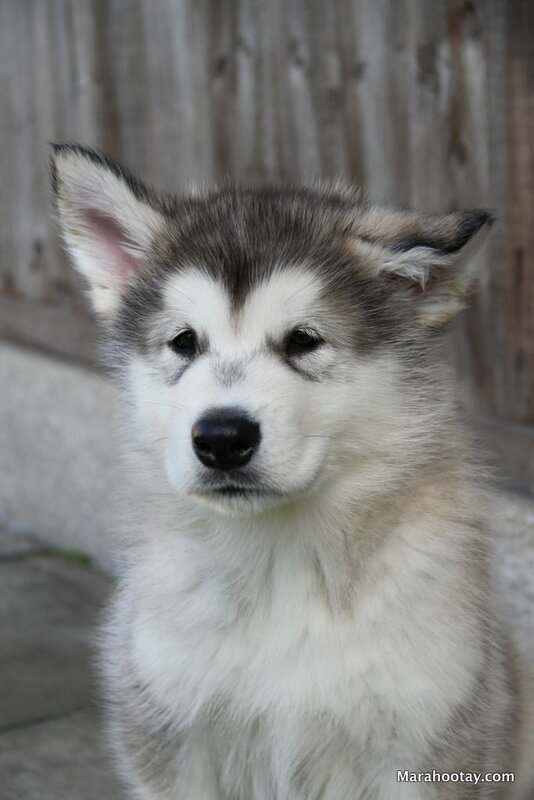 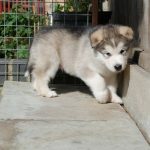 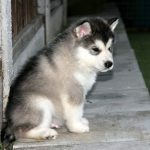 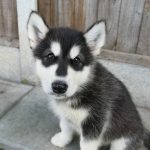 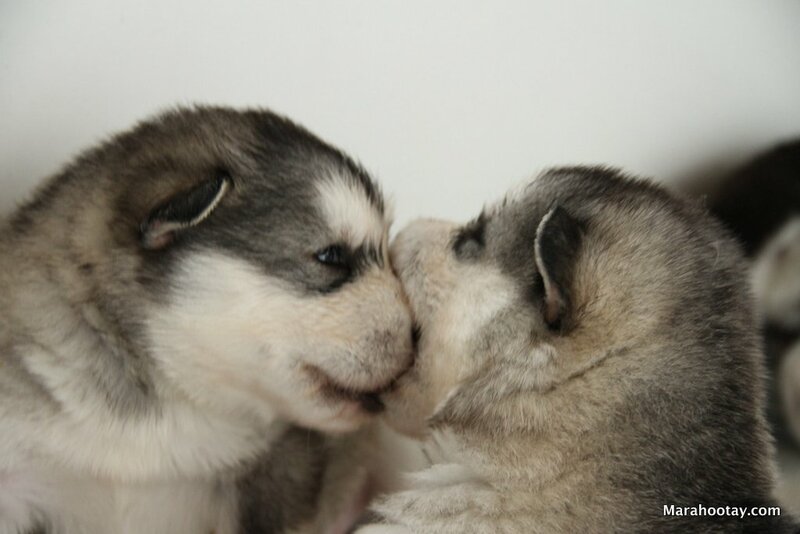 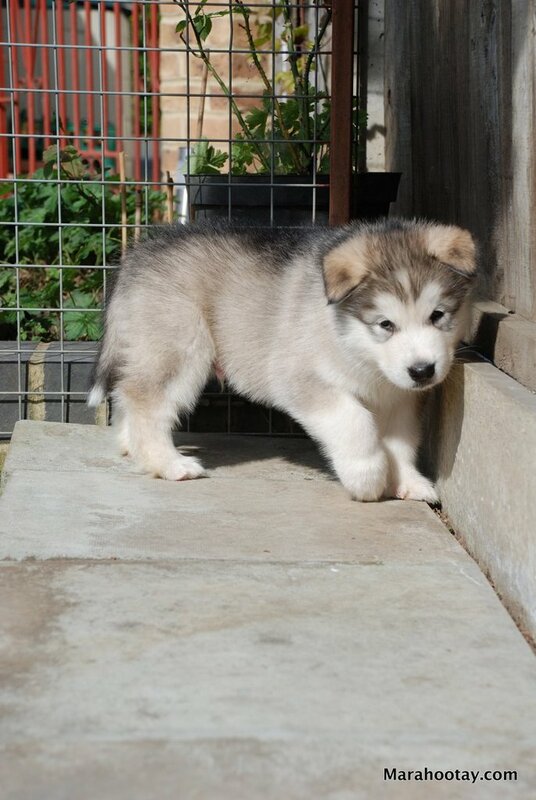 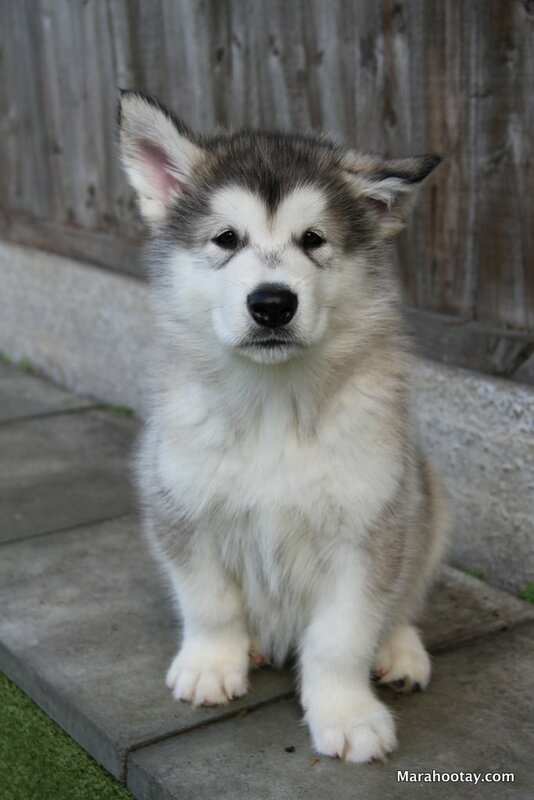 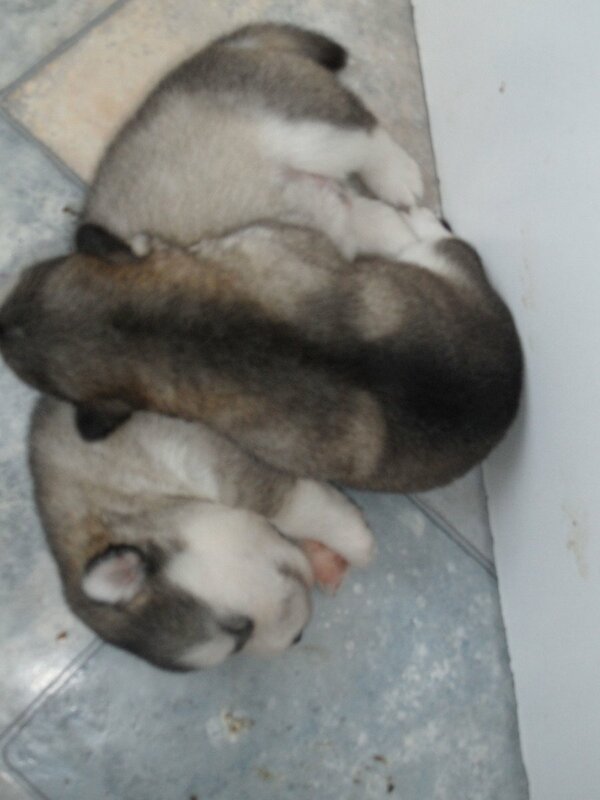 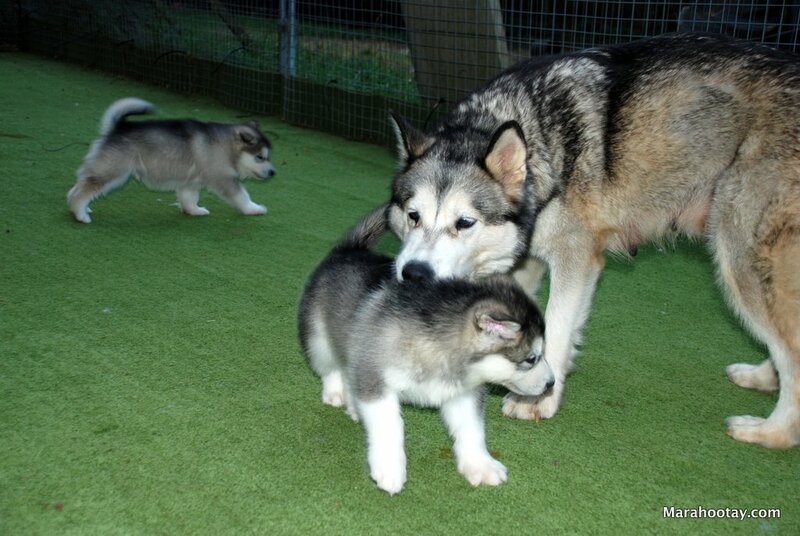 As both parents have CHD numbers all puppies from this litter will also be able to apply for their CHD numbers. 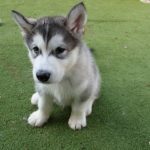 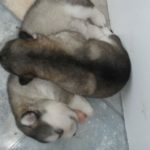 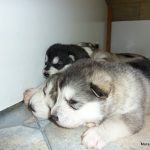 Here are a few pictures of our August litter … more will be posted soon! 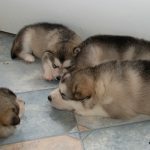 Growing cuter by the day, here are some photos of the litter at 3 weeks old. 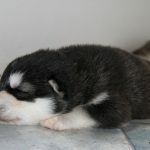 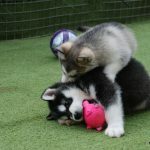 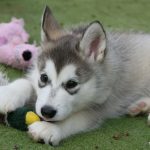 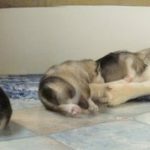 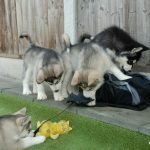 Following our pictures posted earlier in the week, here is a video of the litter doing what they do best! 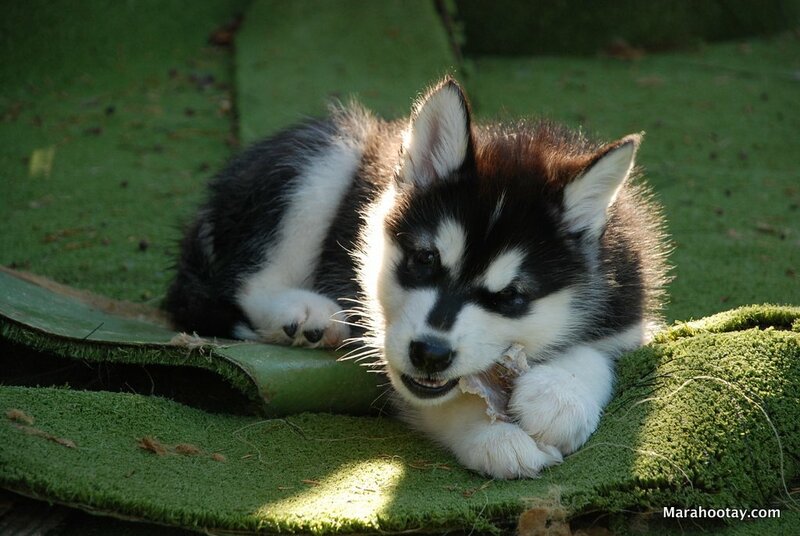 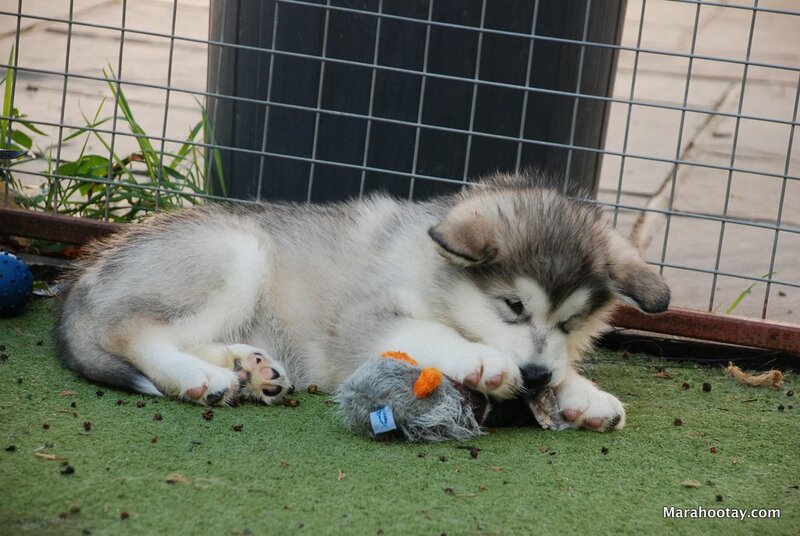 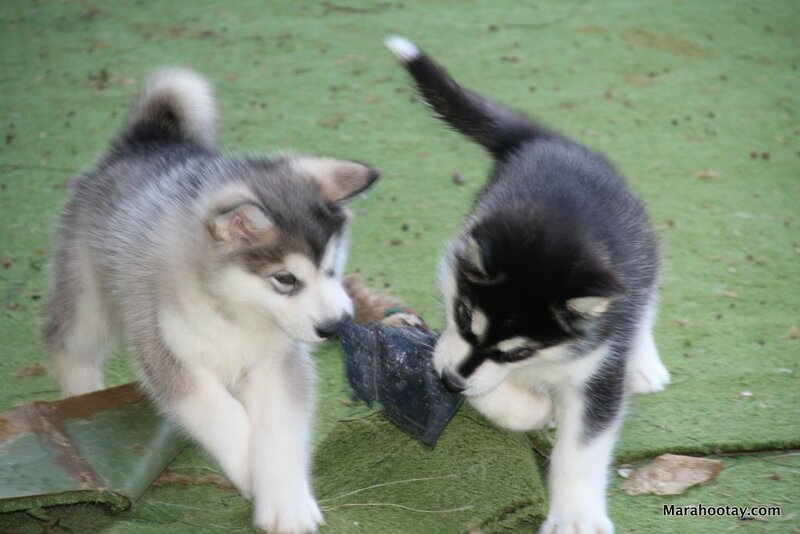 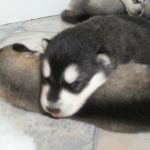 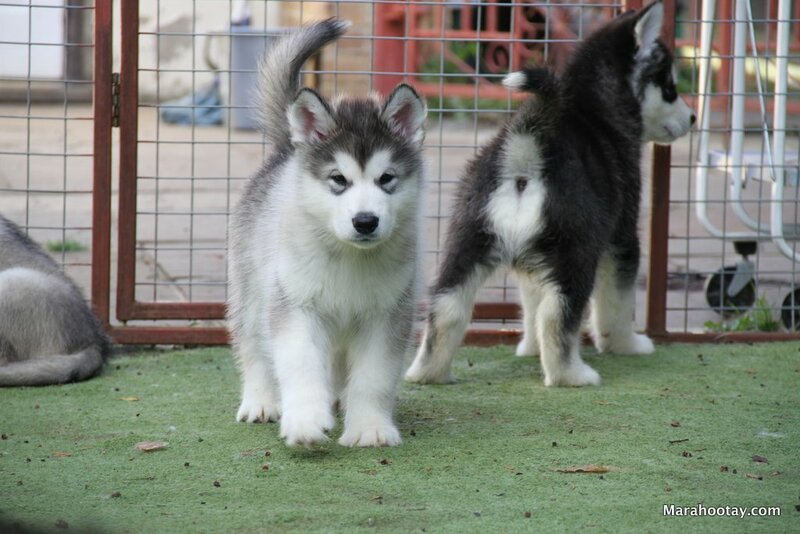 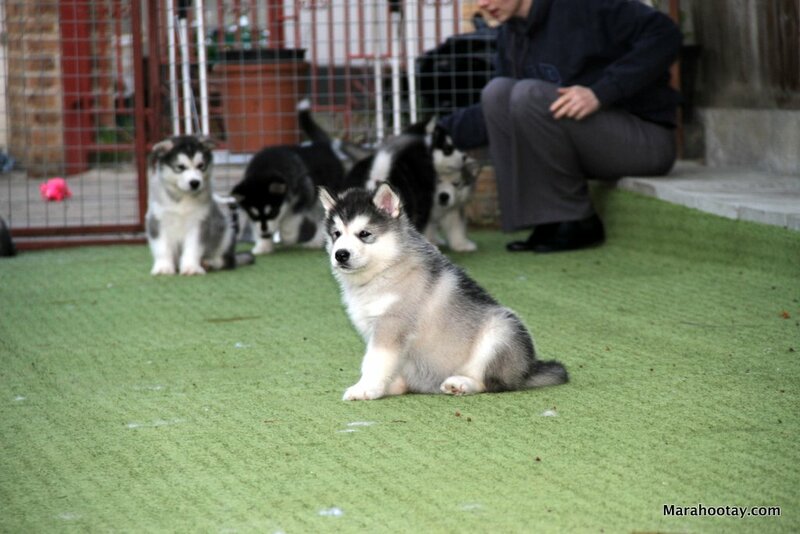 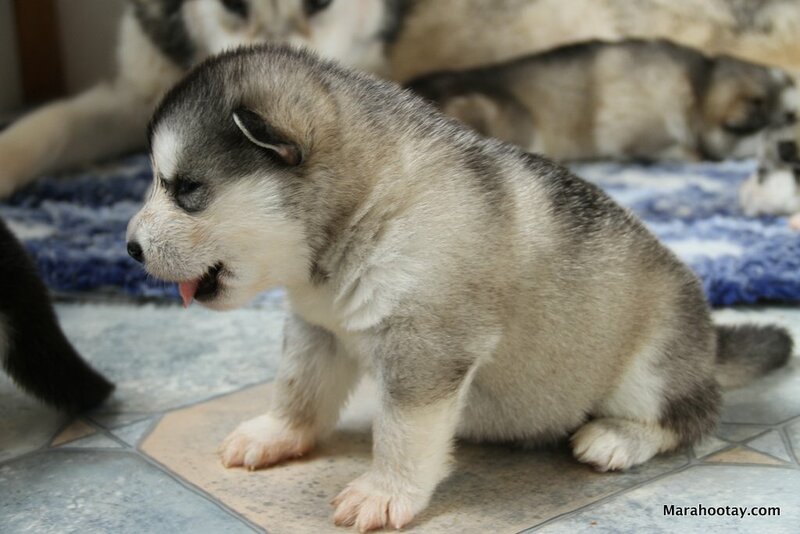 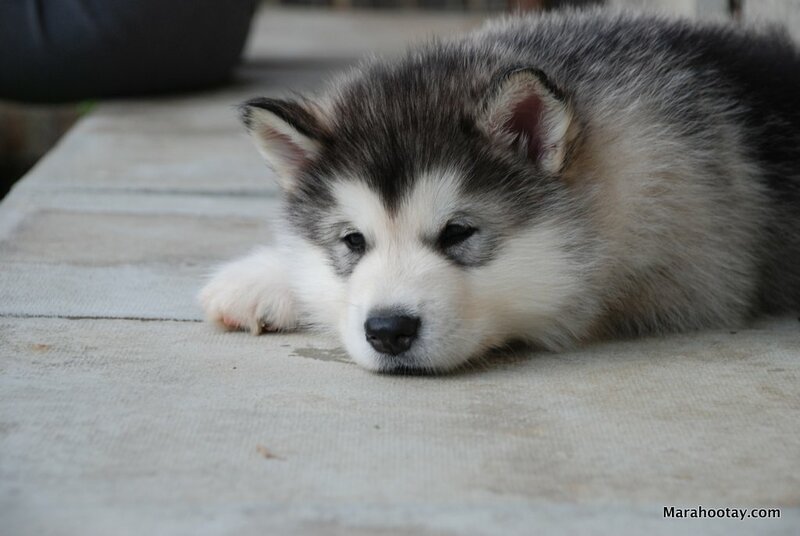 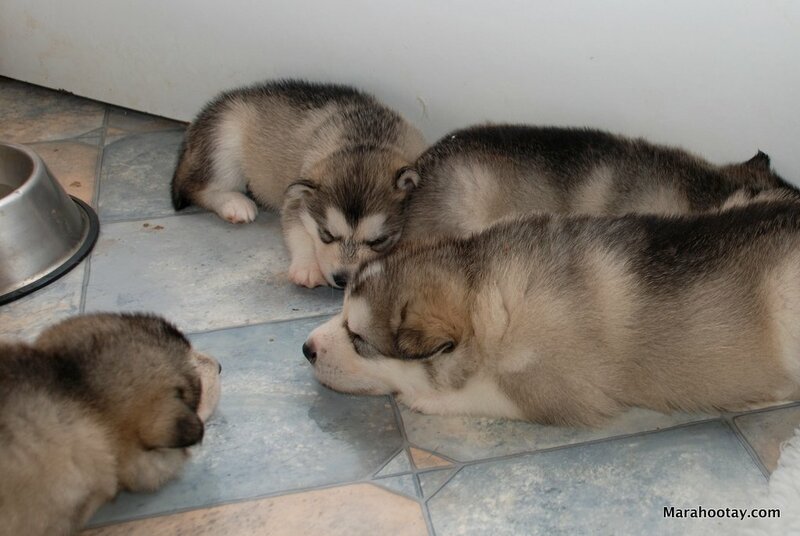 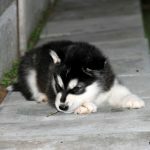 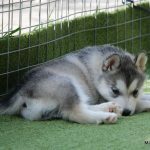 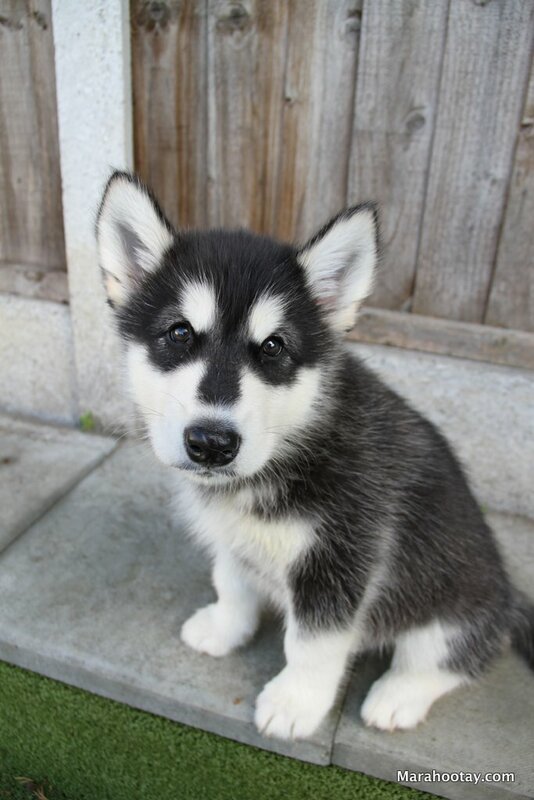 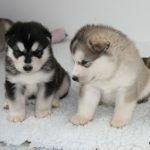 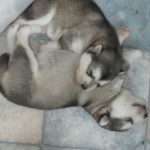 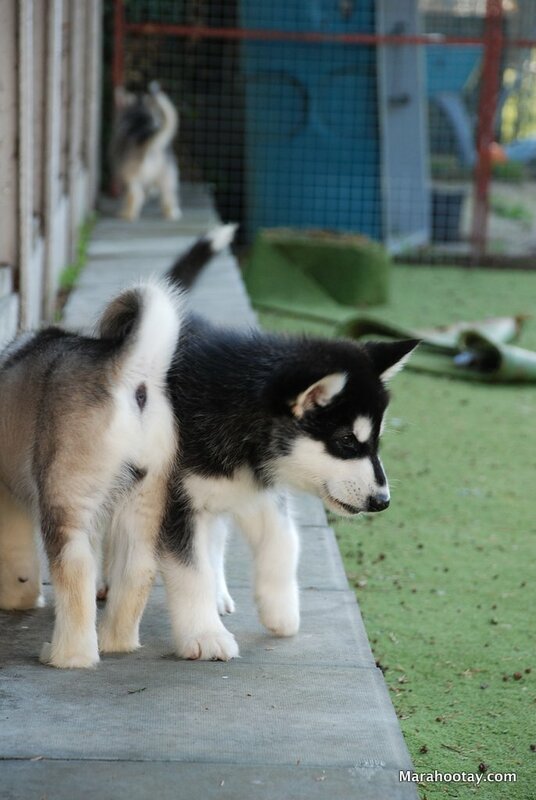 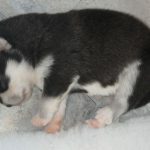 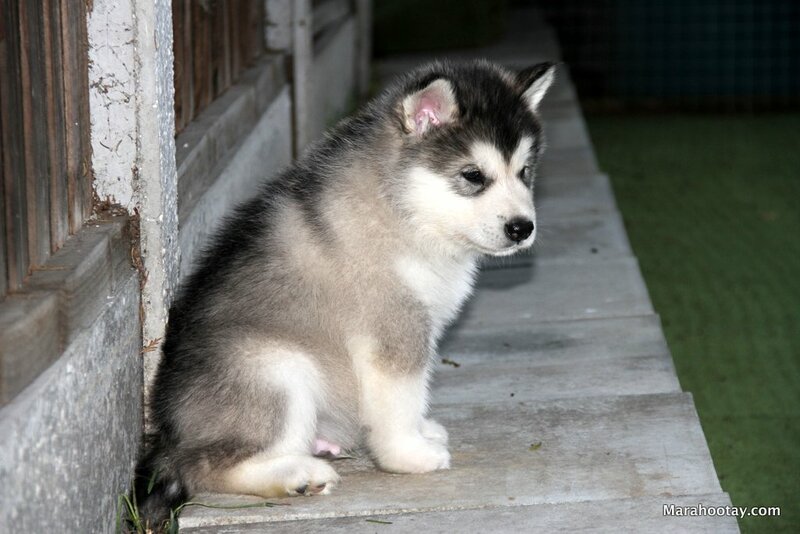 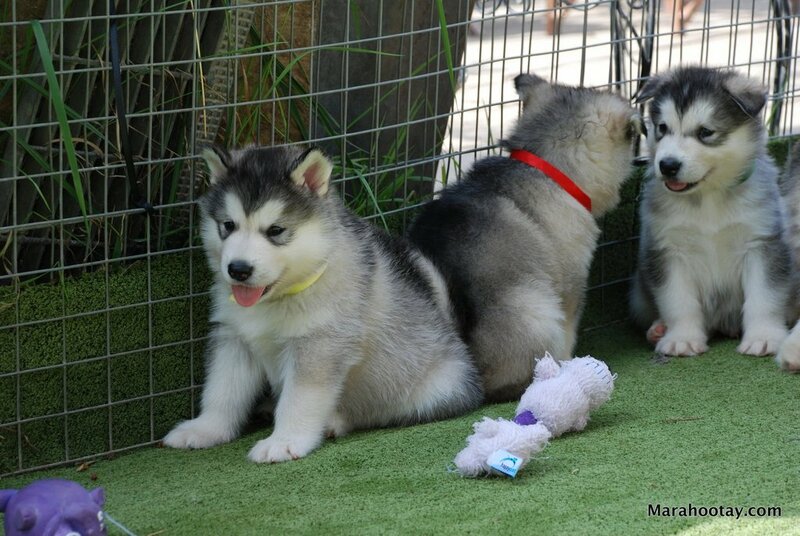 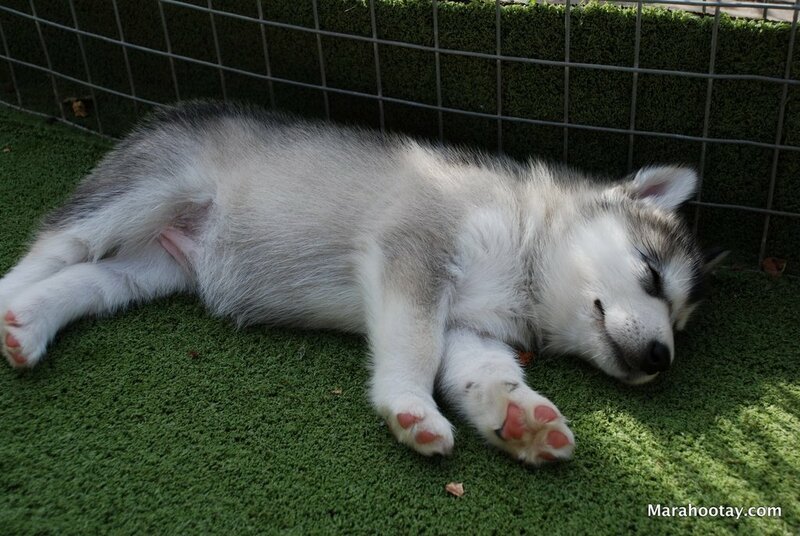 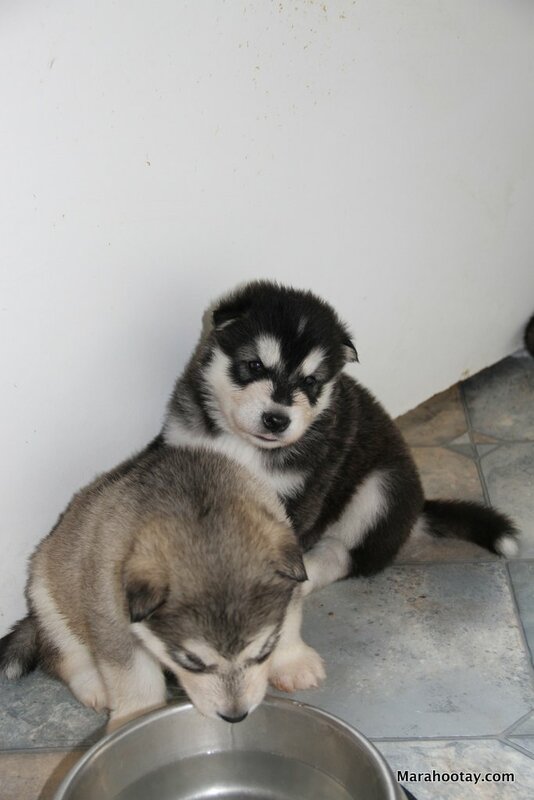 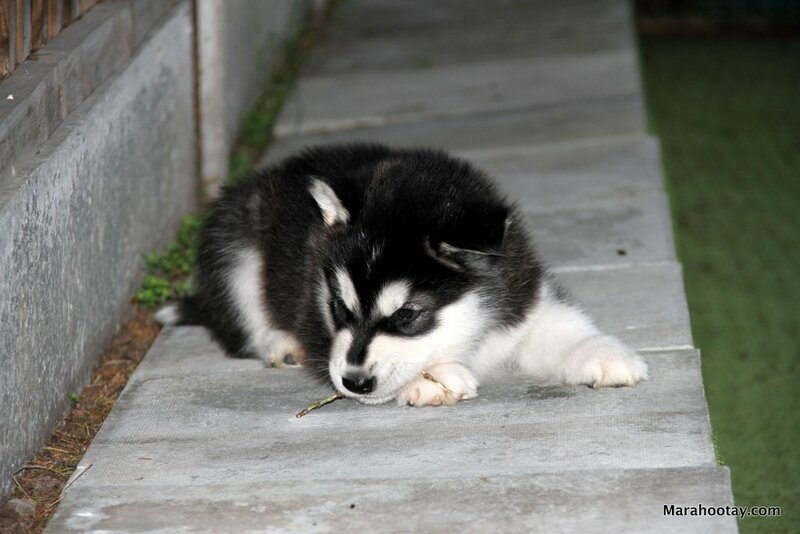 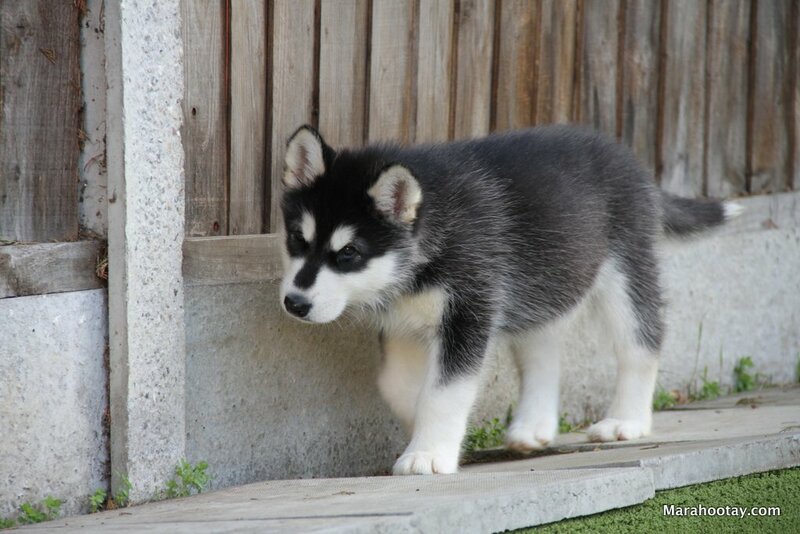 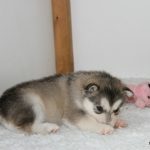 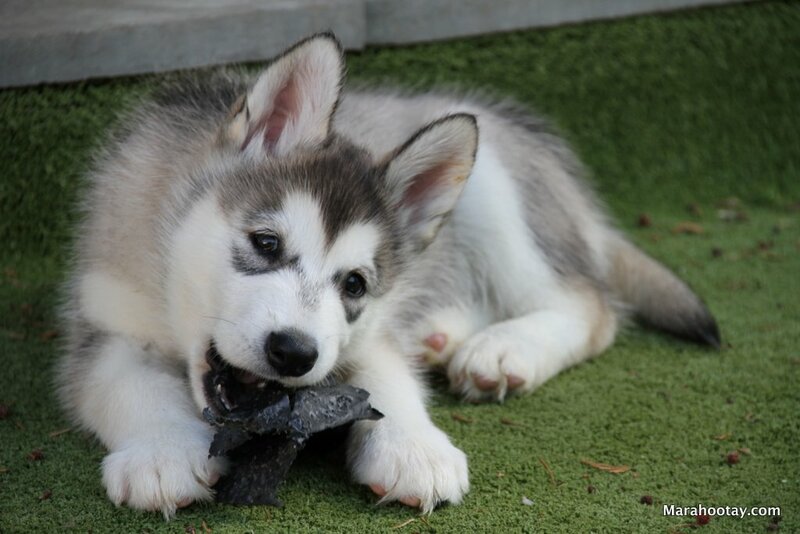 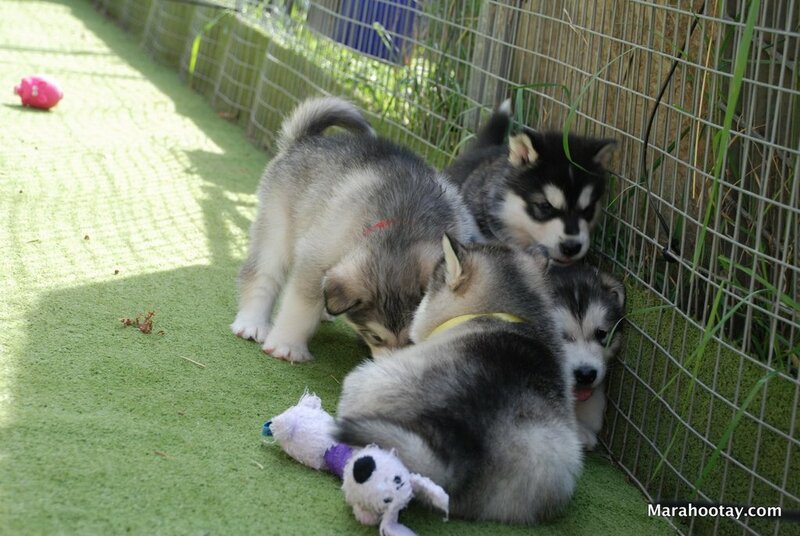 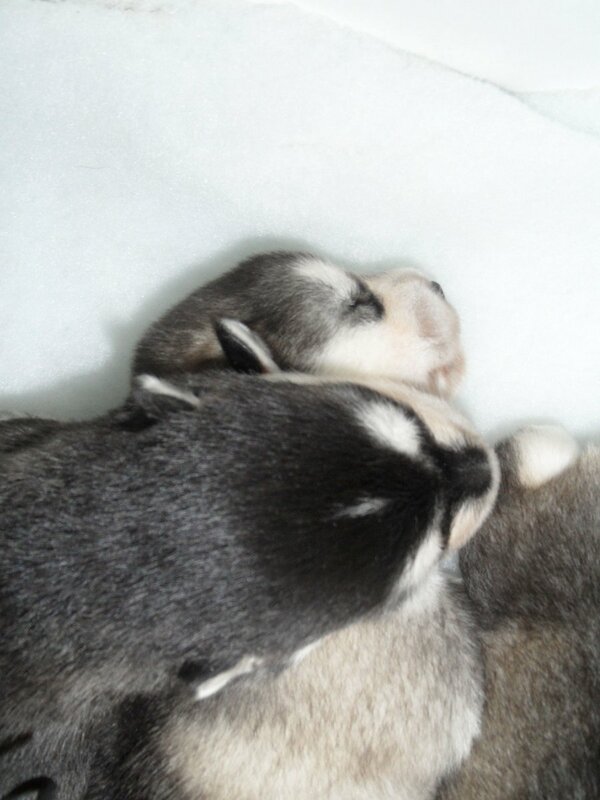 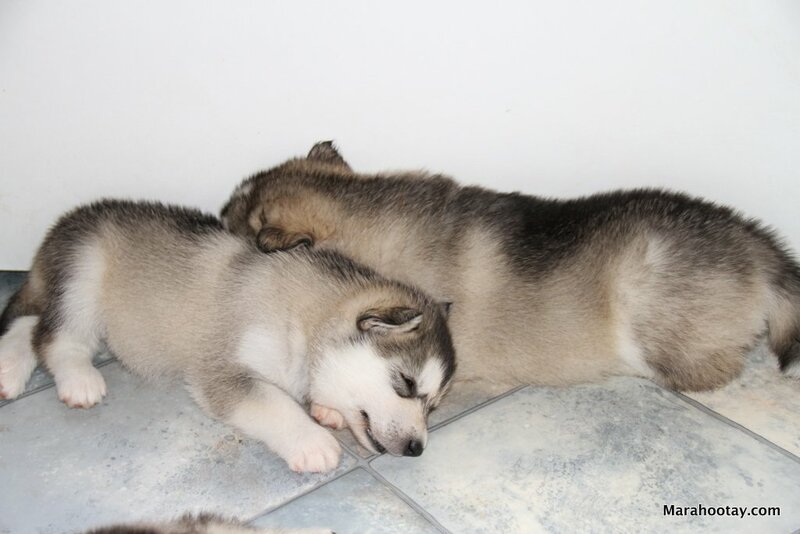 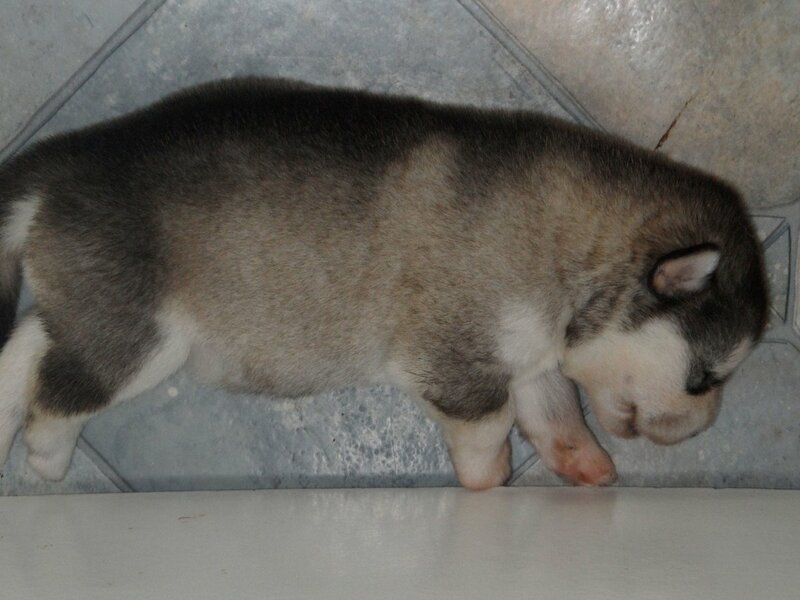 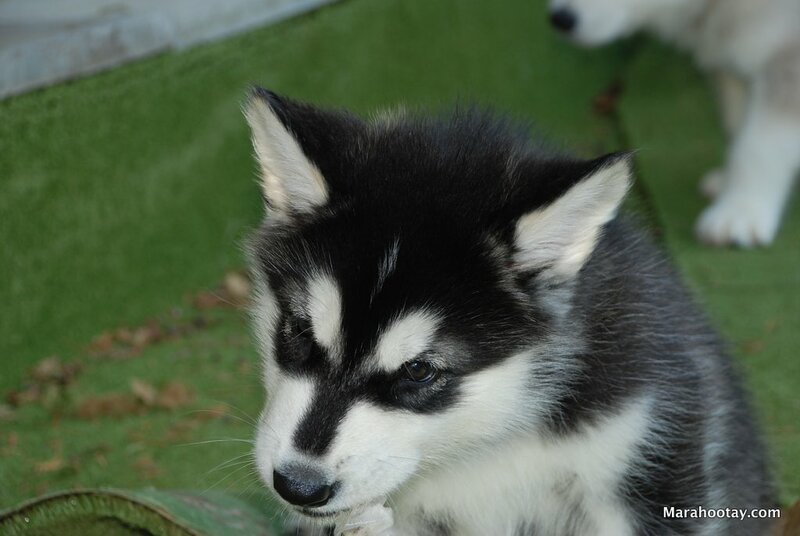 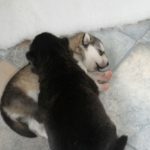 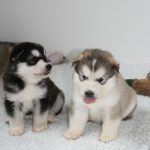 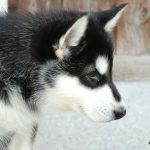 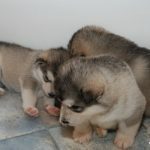 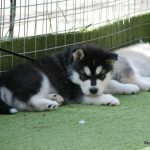 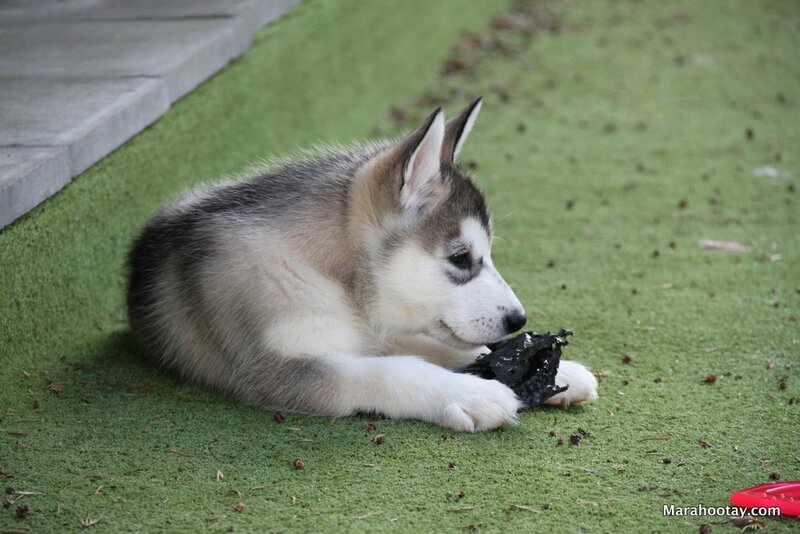 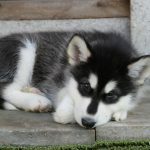 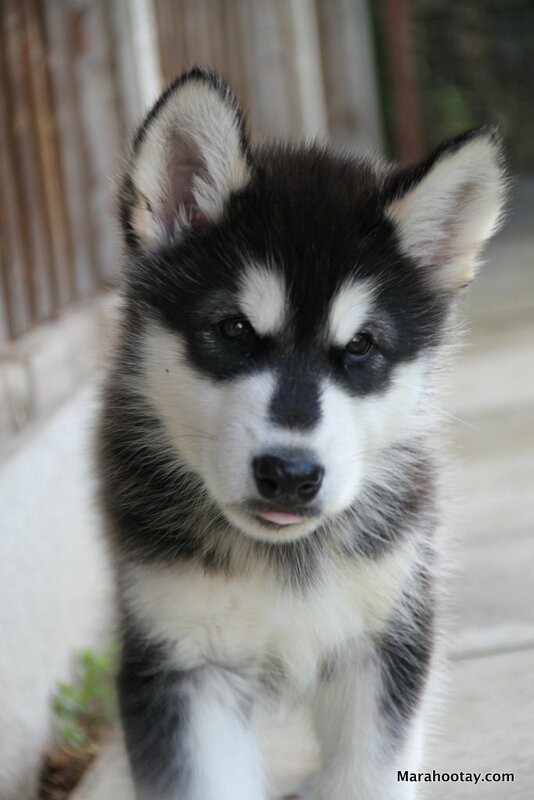 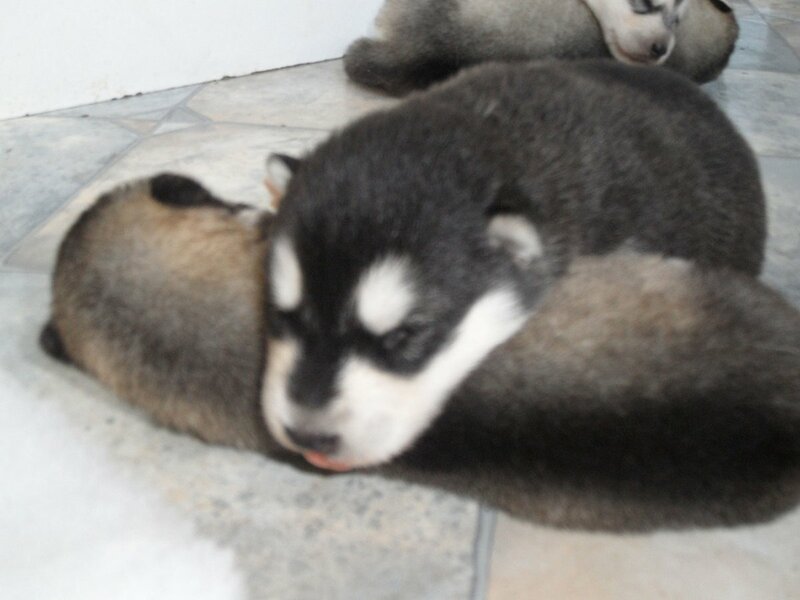 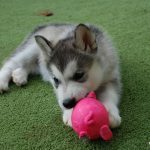 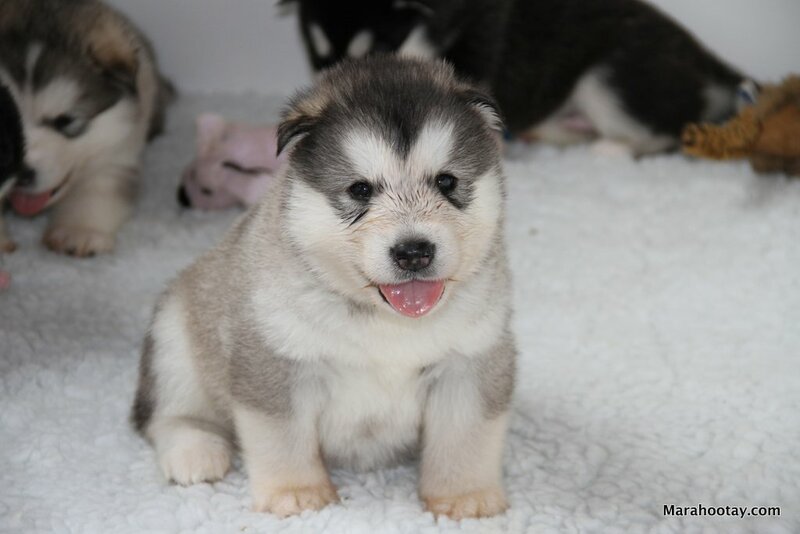 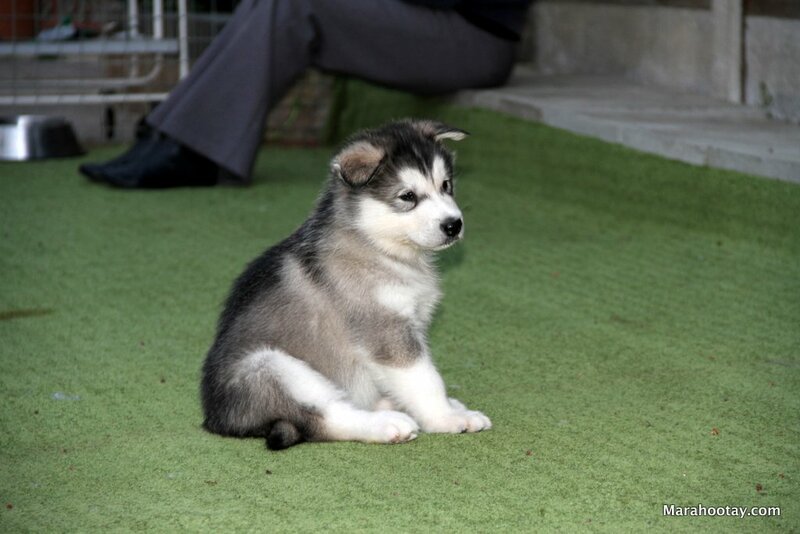 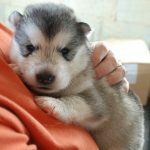 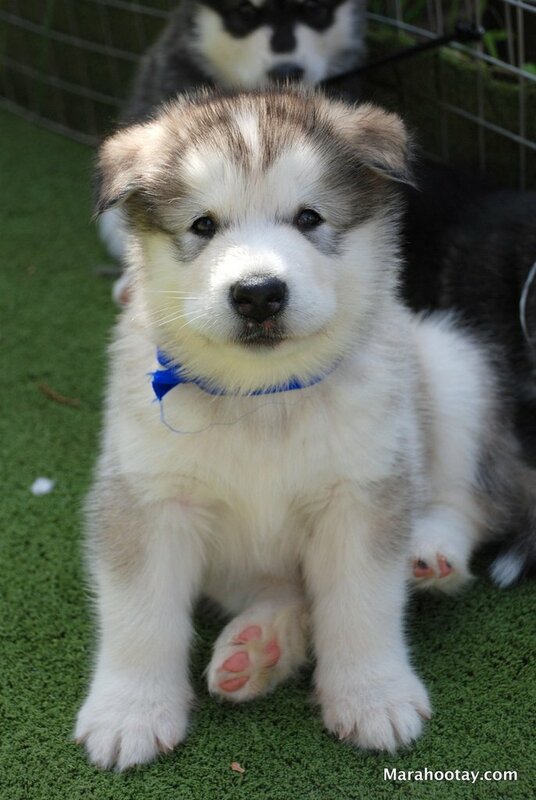 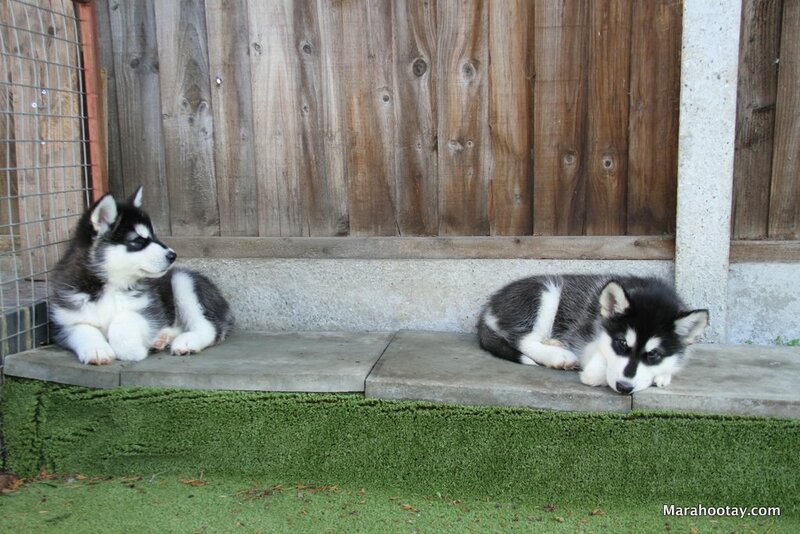 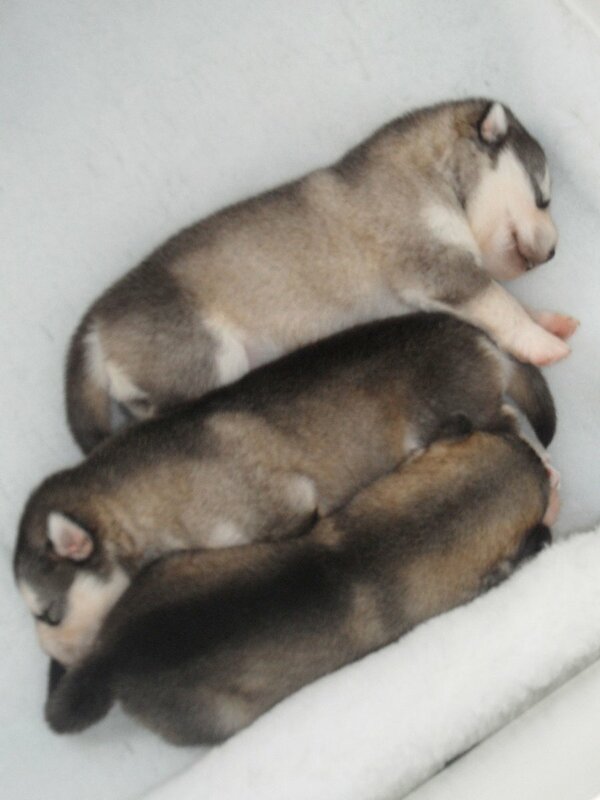 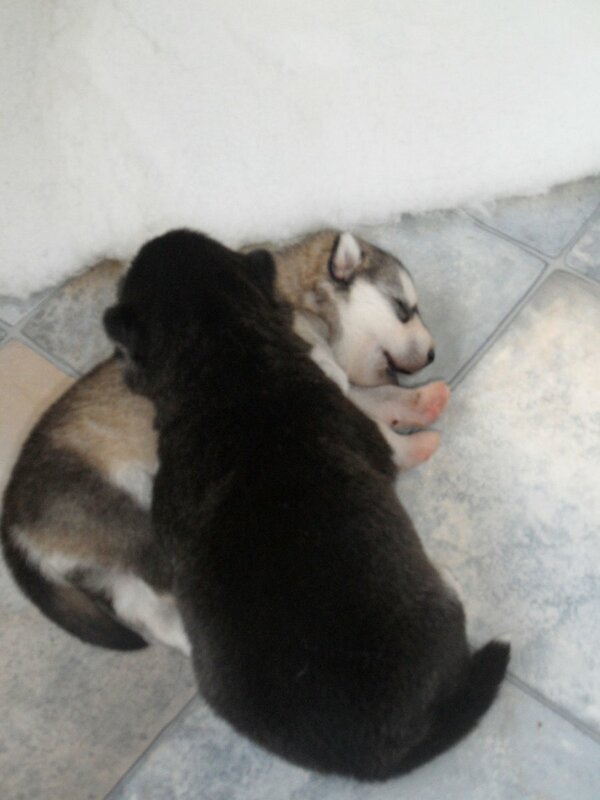 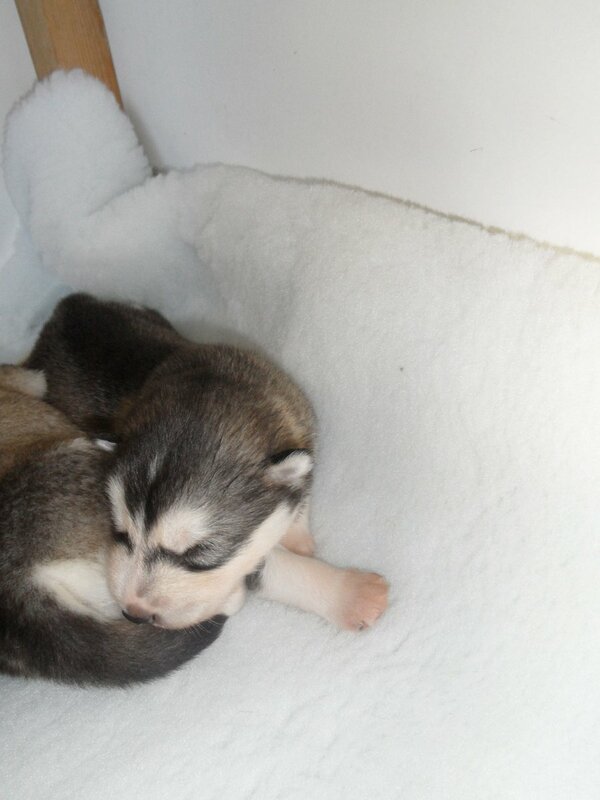 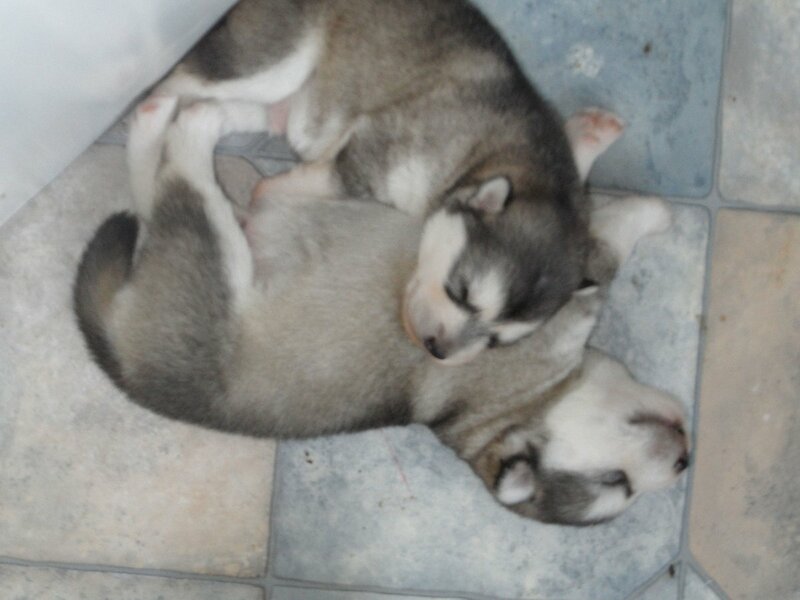 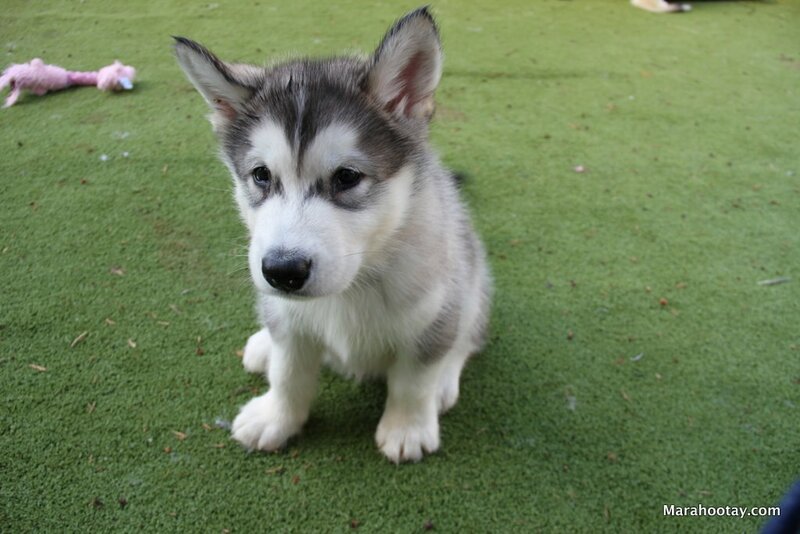 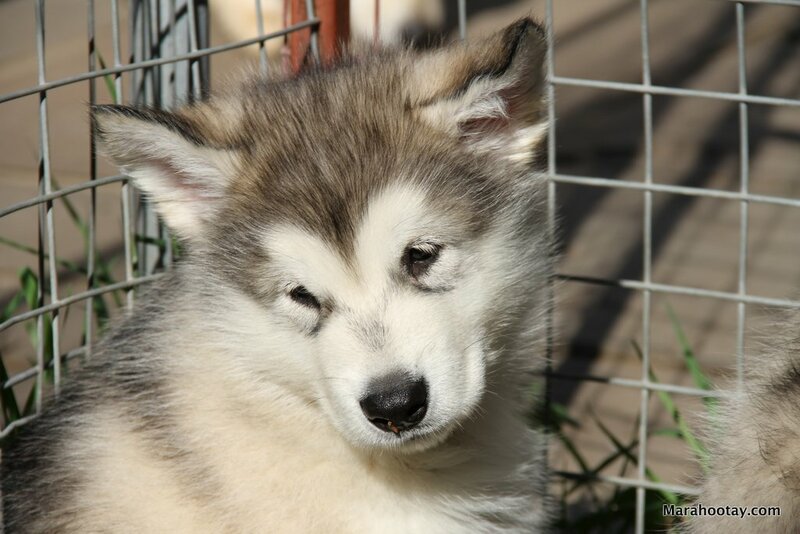 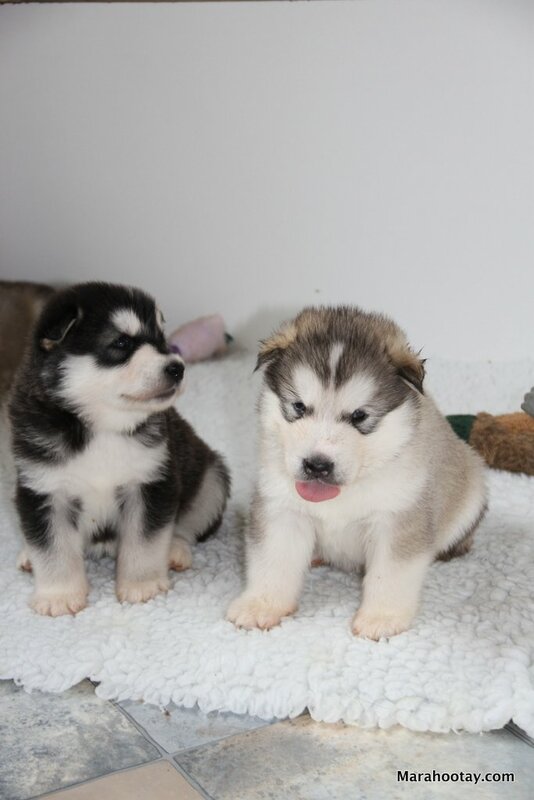 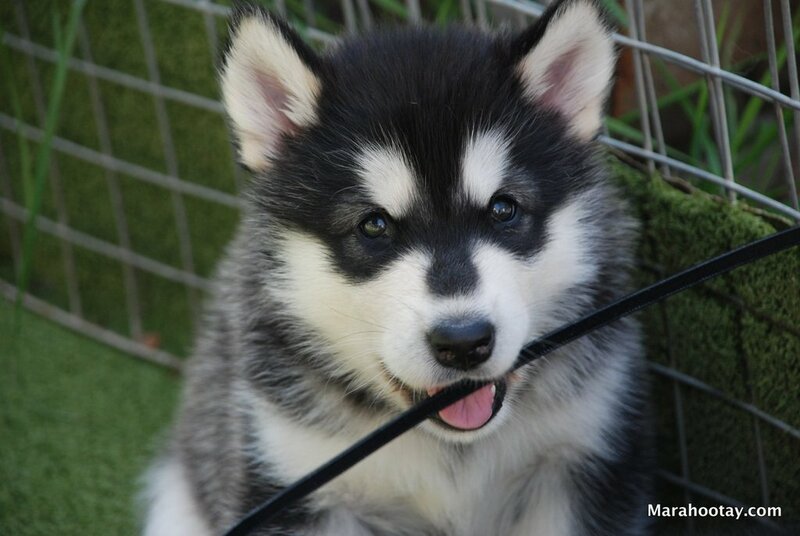 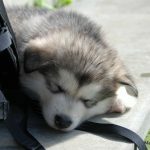 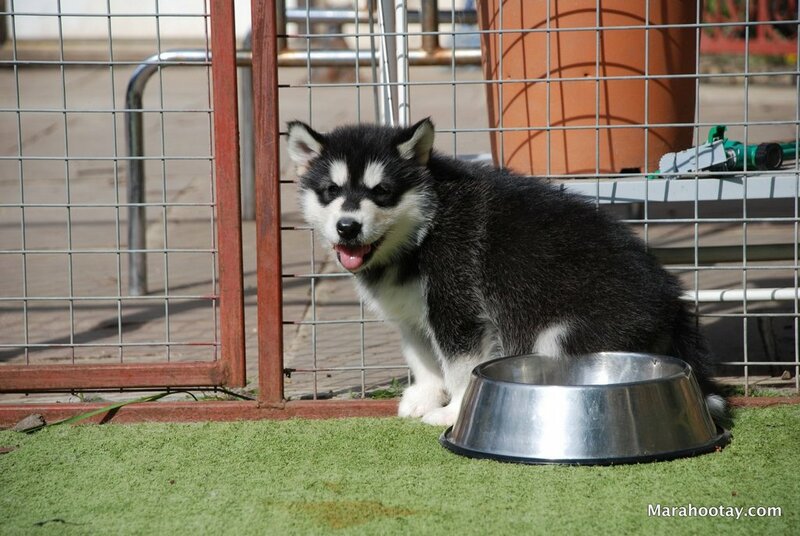 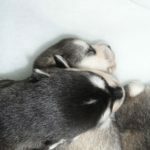 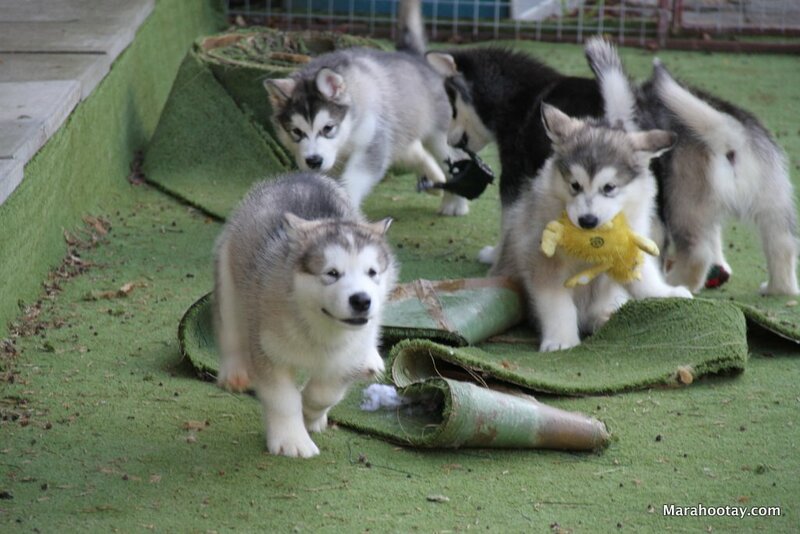 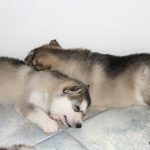 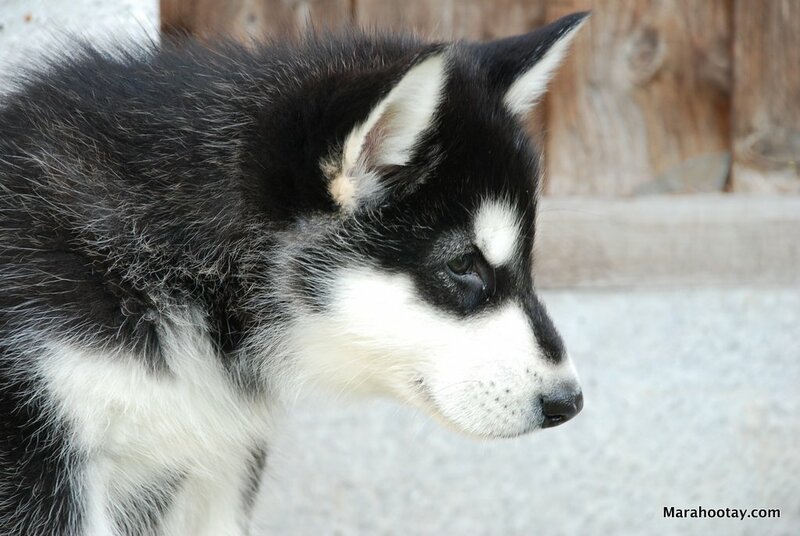 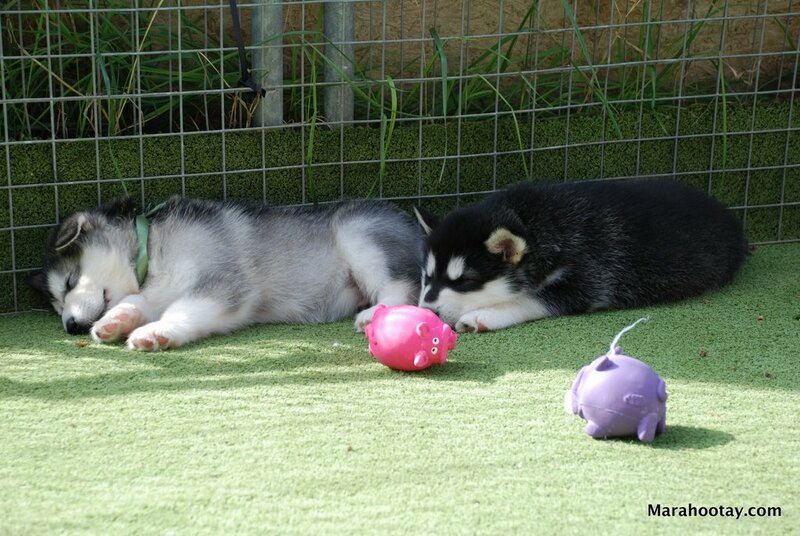 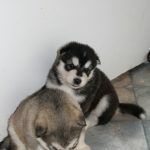 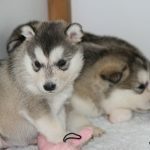 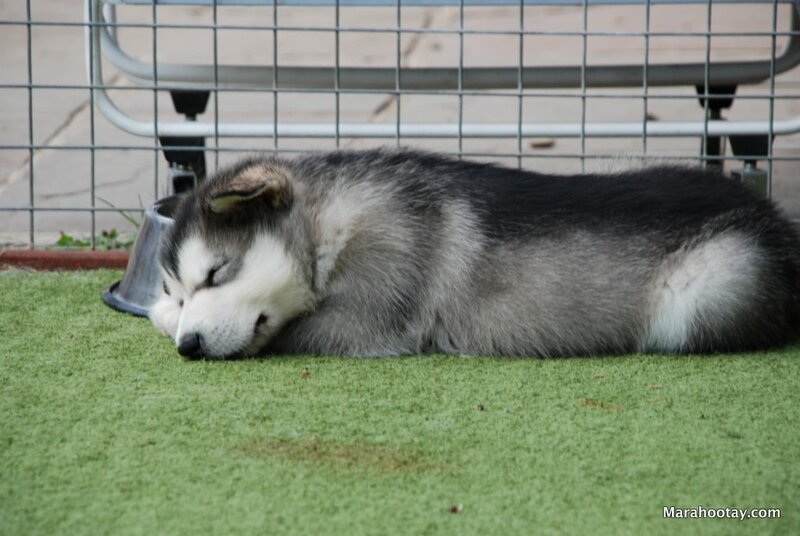 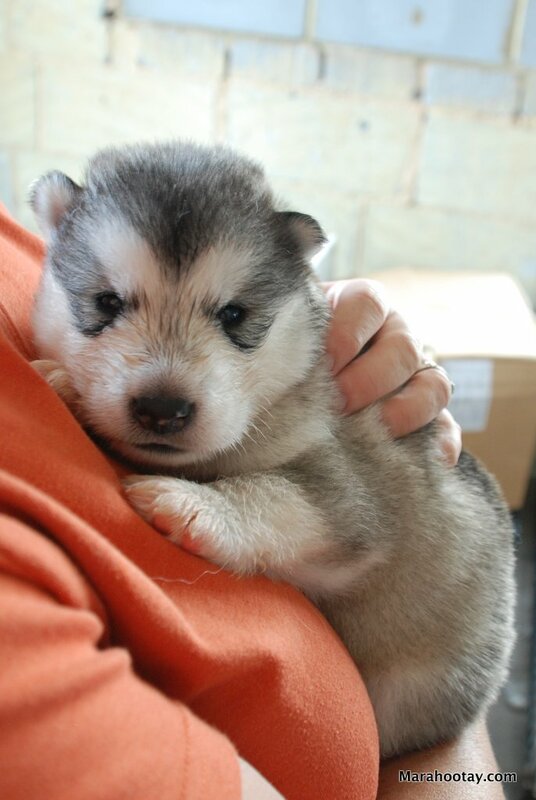 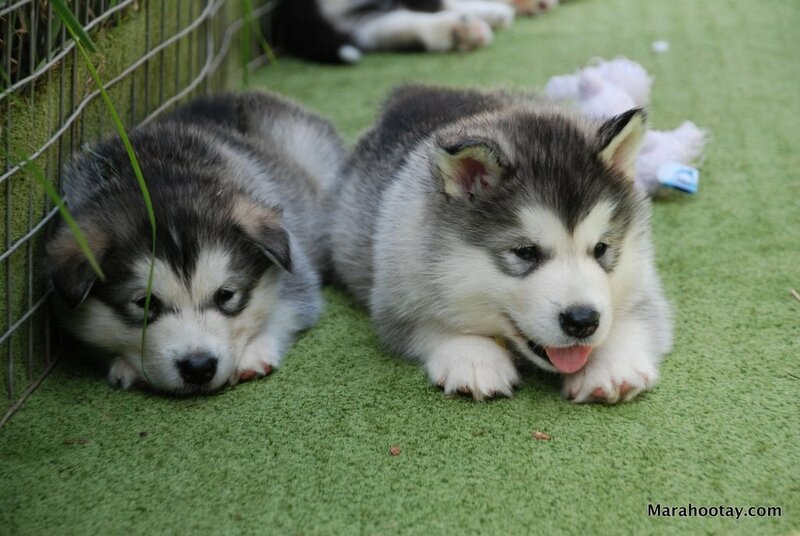 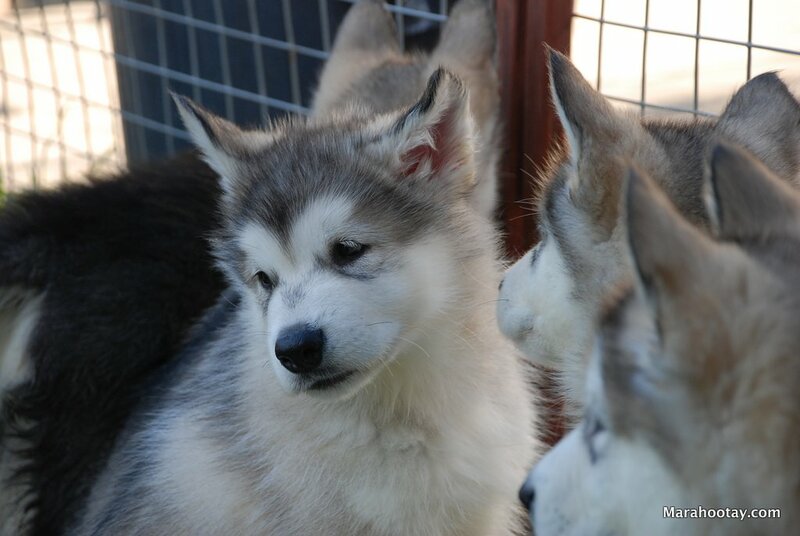 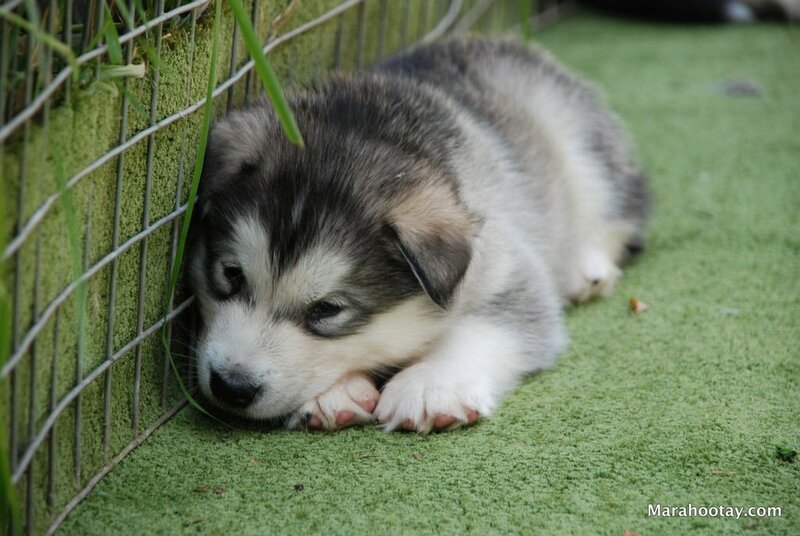 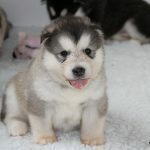 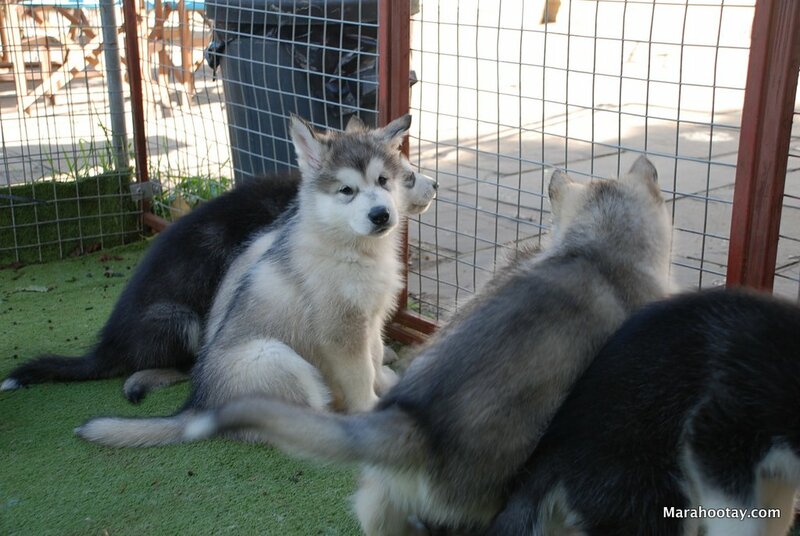 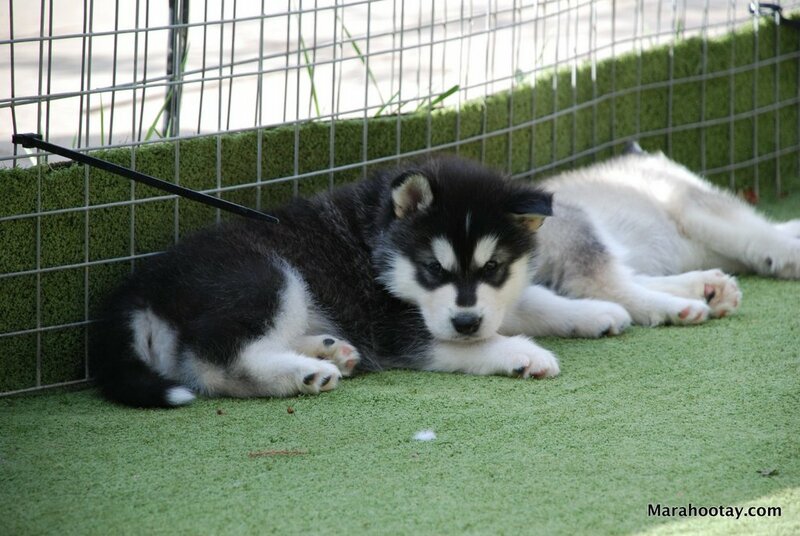 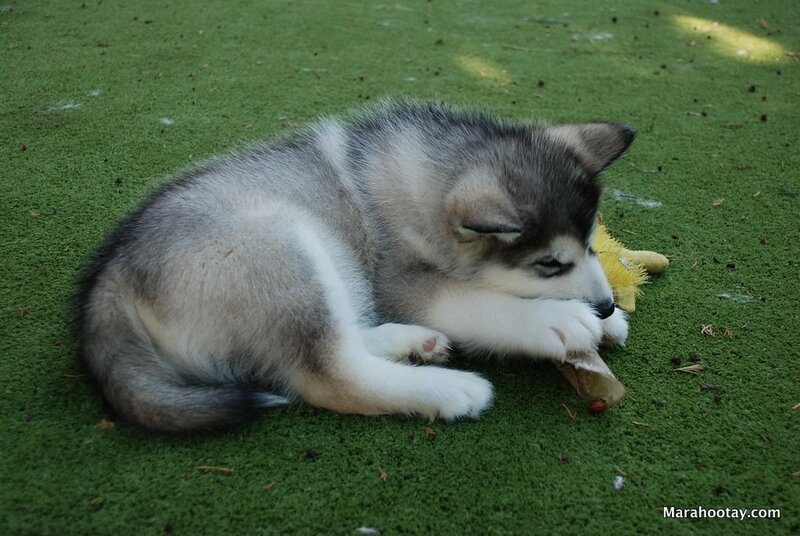 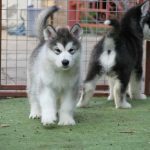 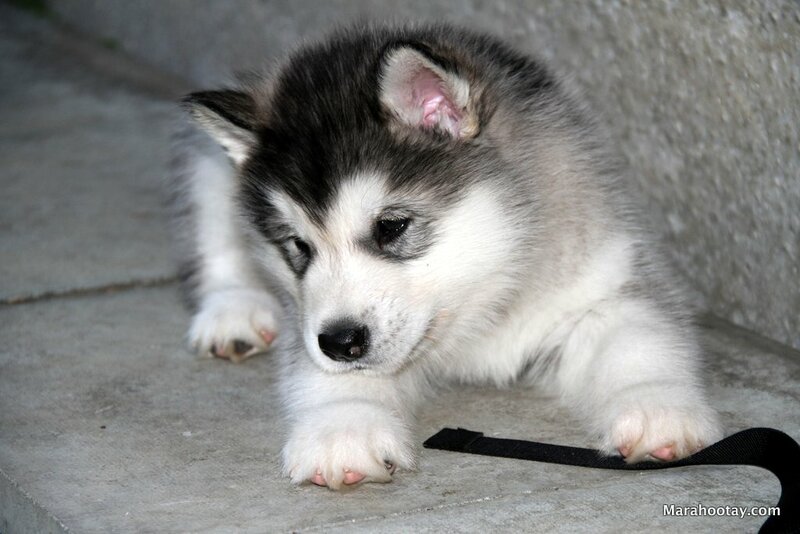 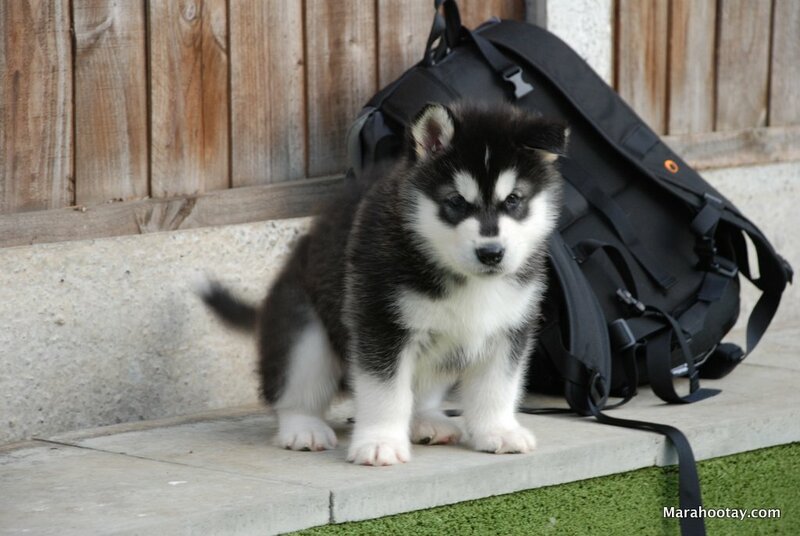 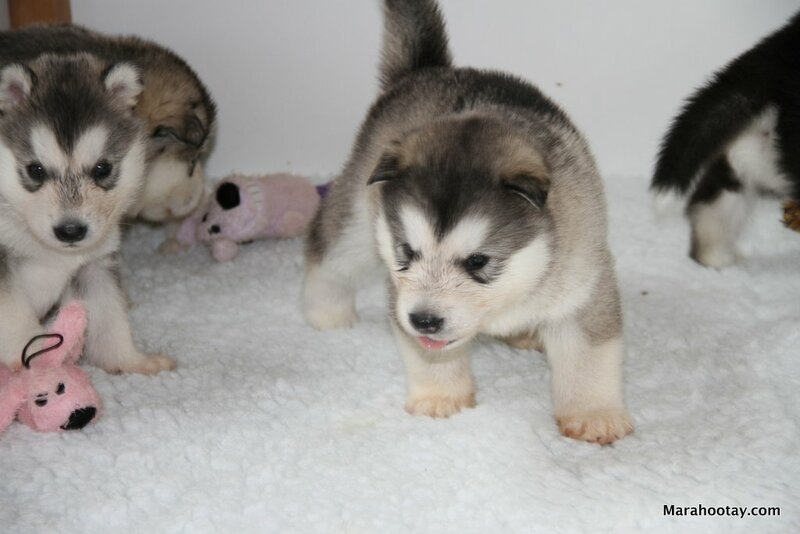 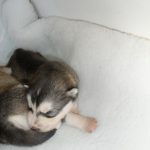 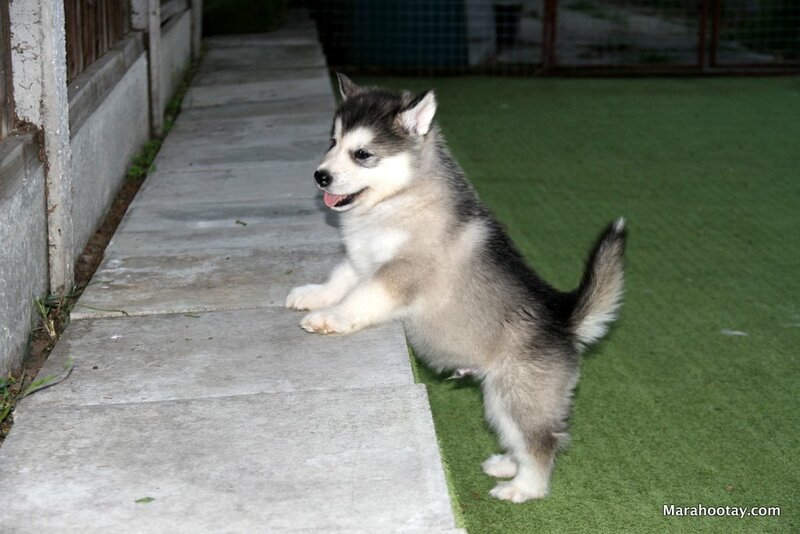 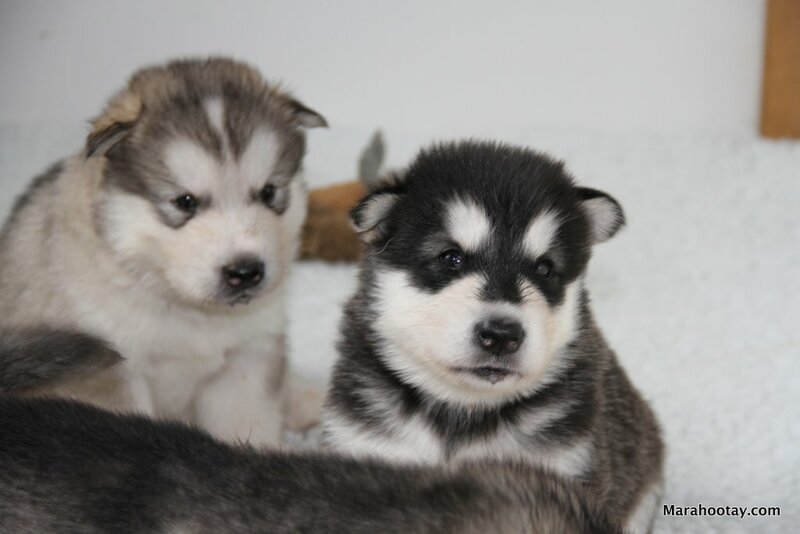 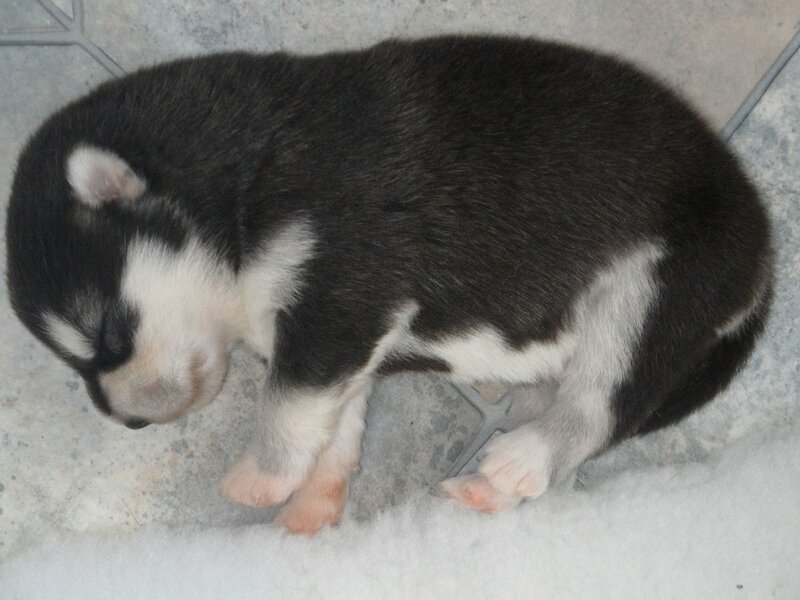 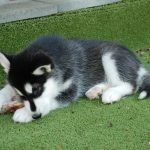 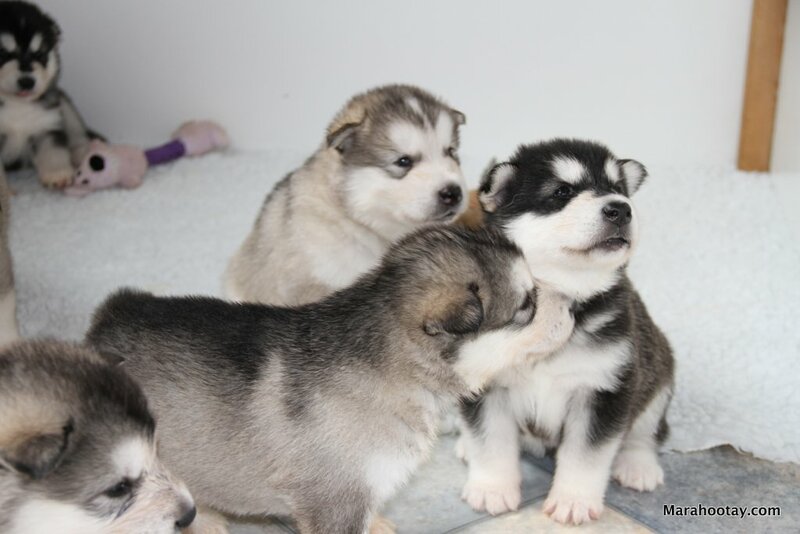 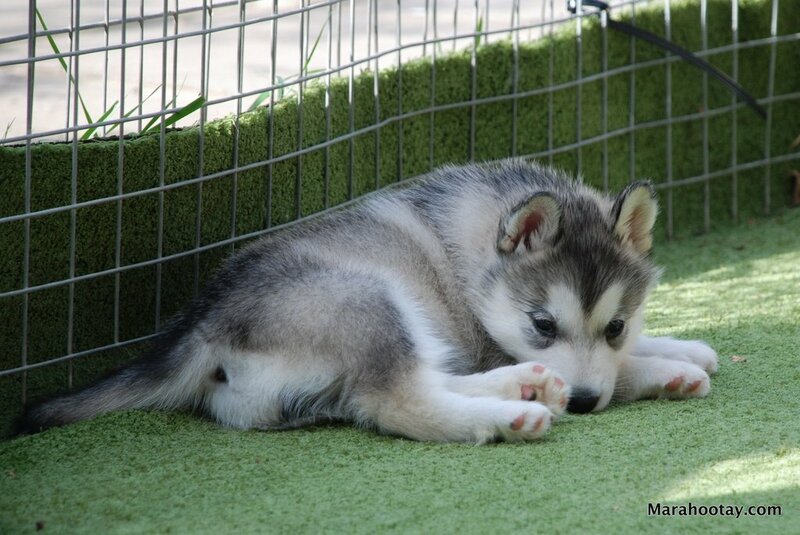 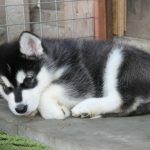 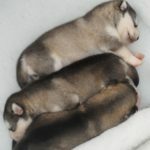 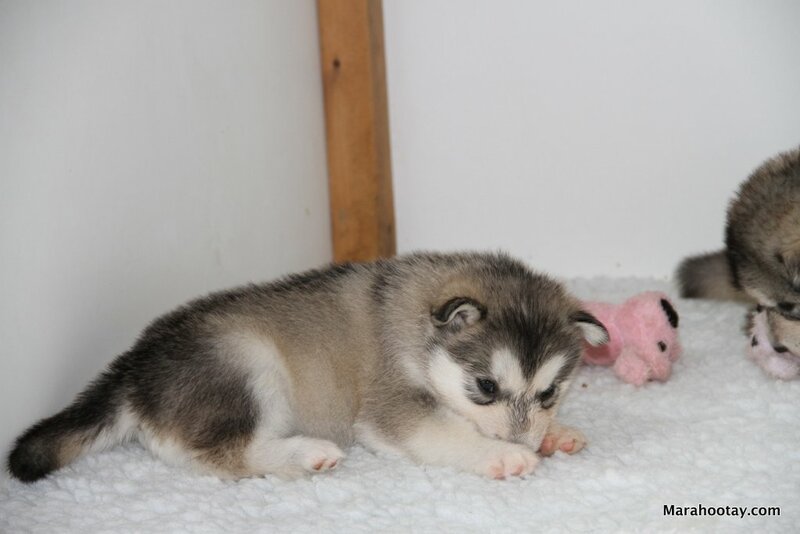 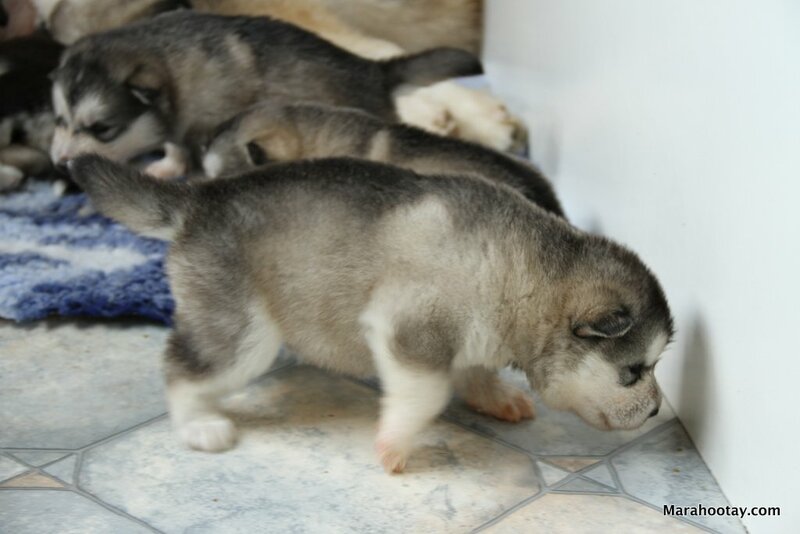 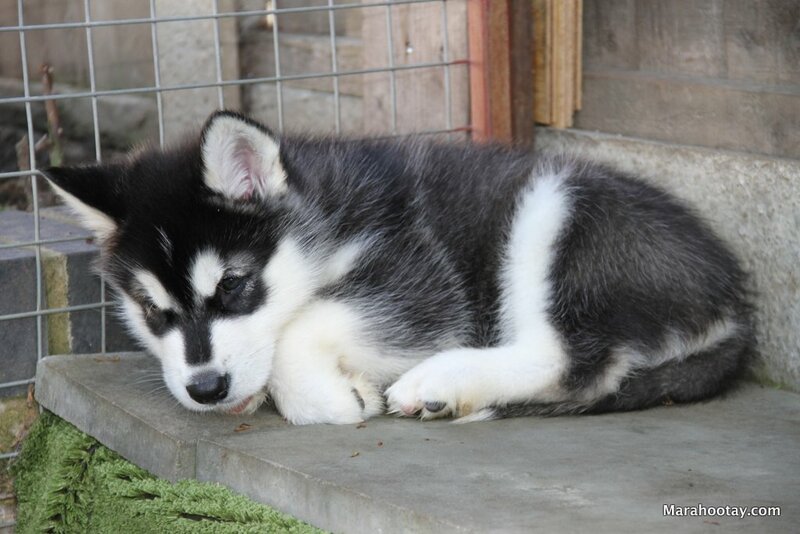 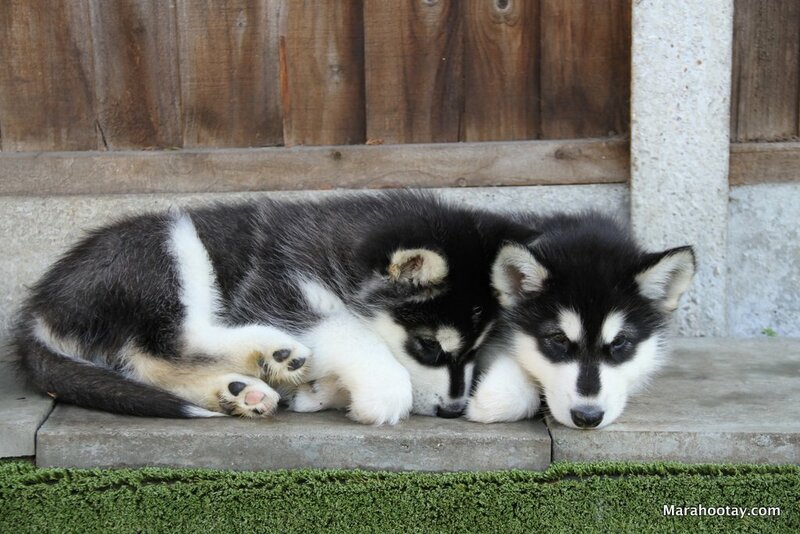 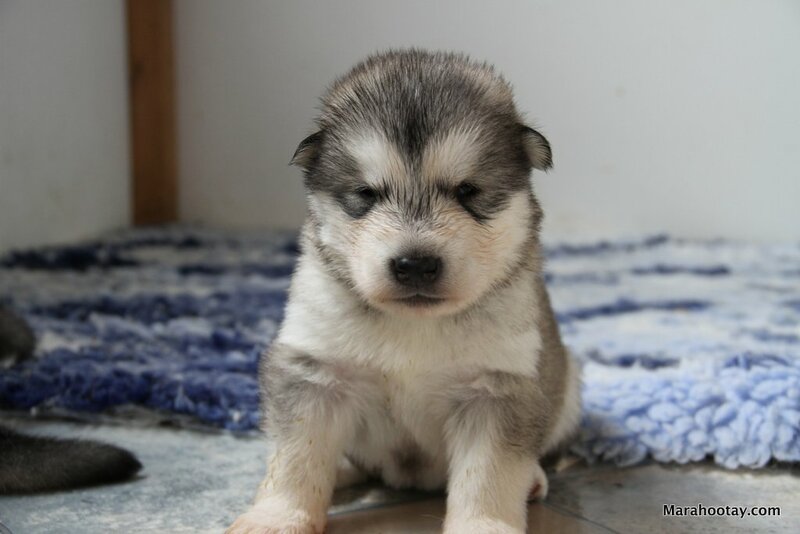 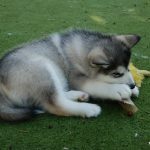 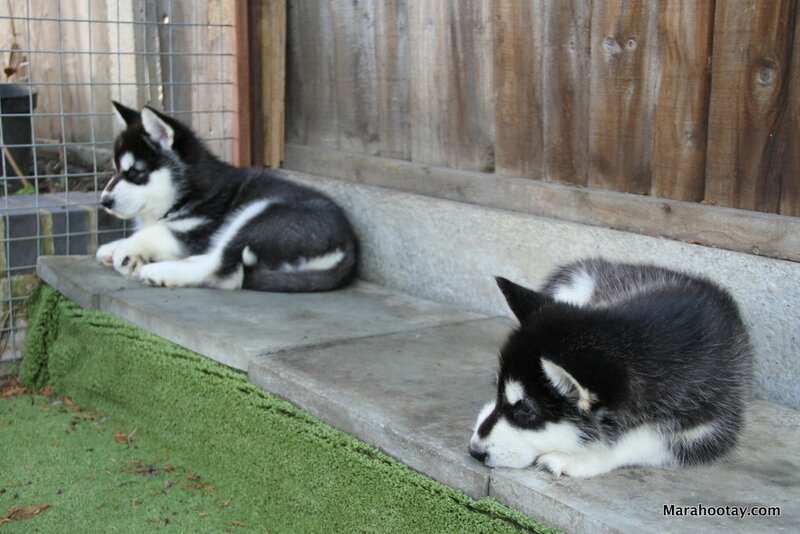 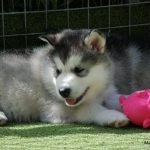 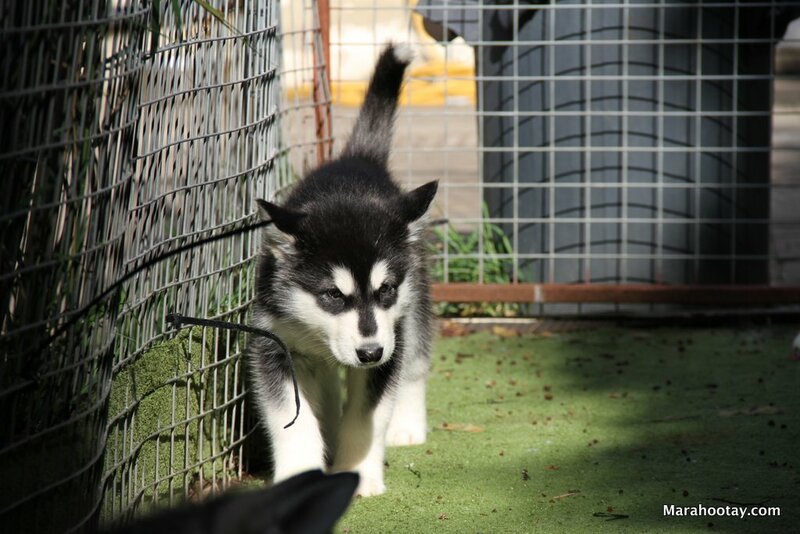 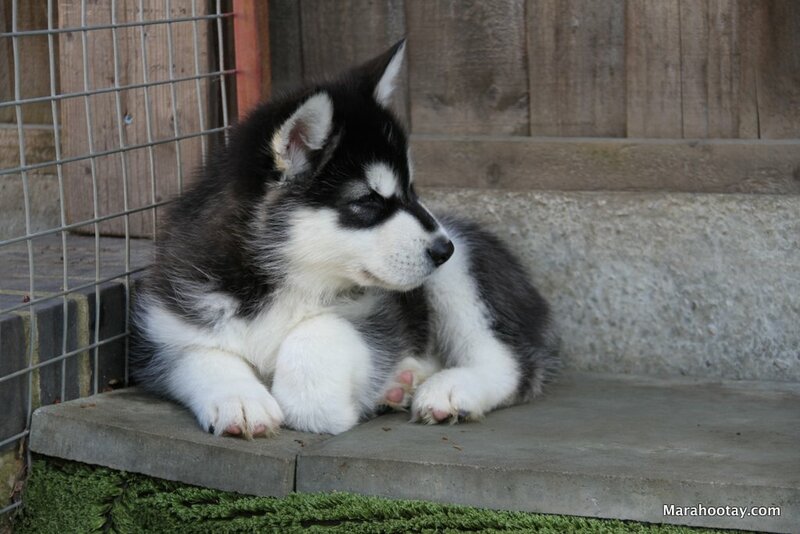 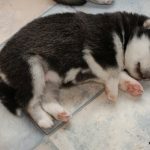 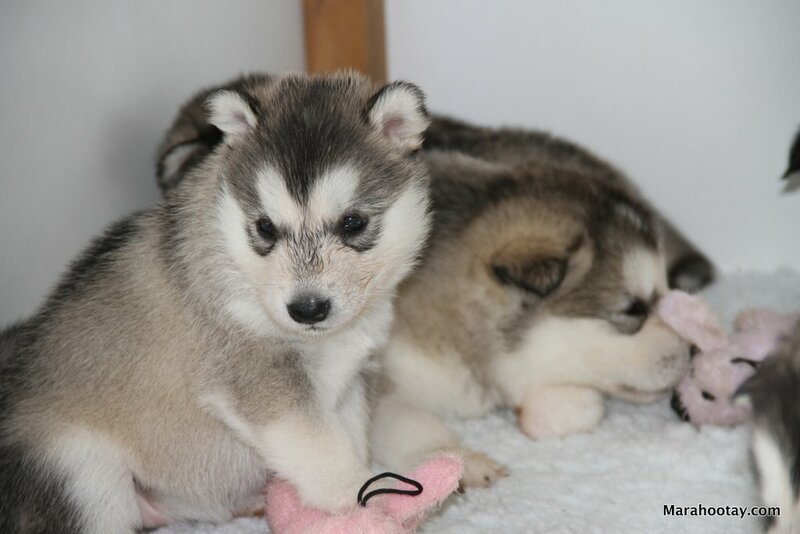 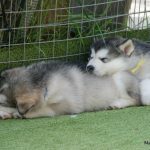 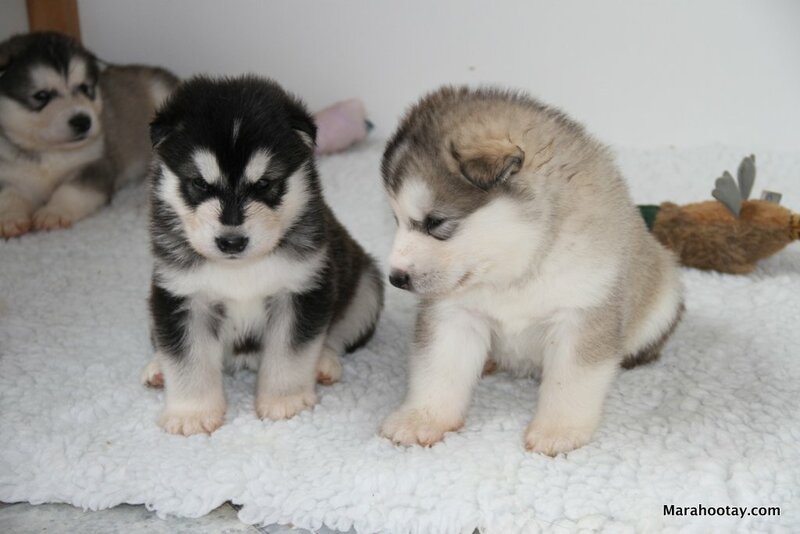 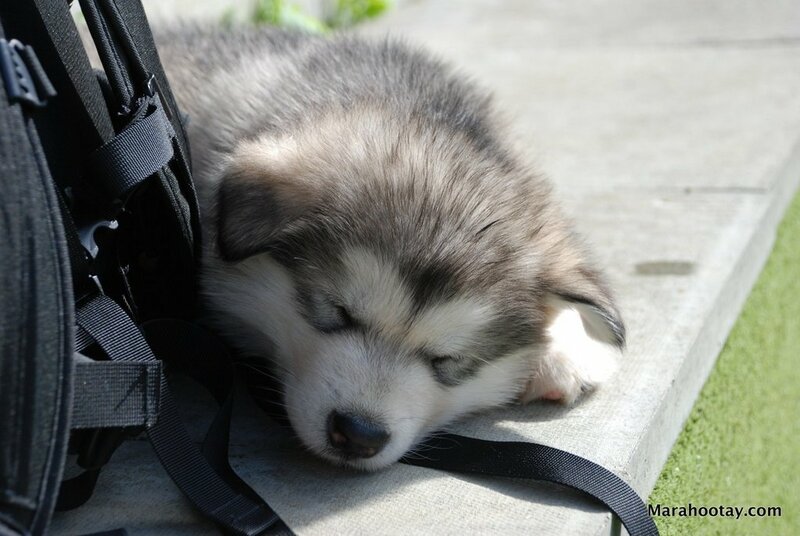 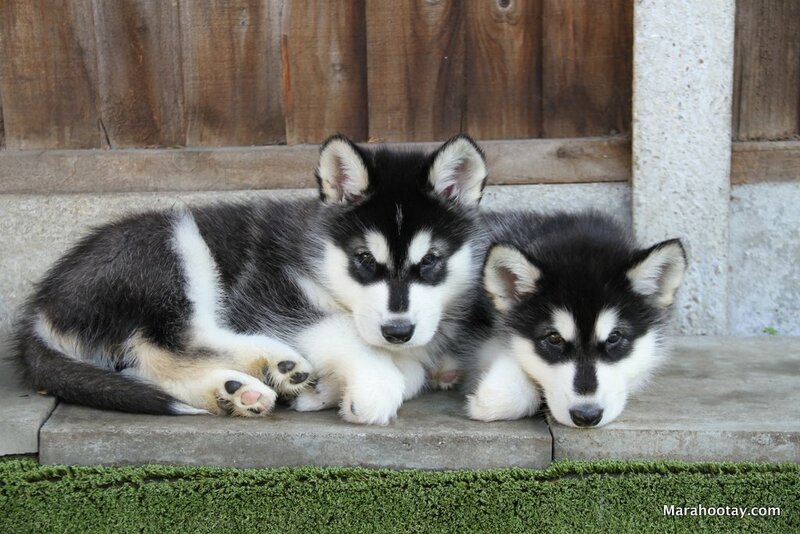 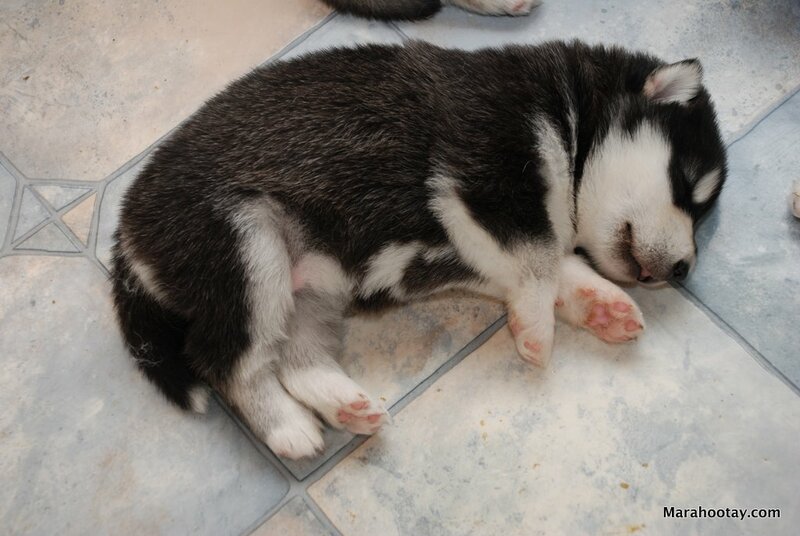 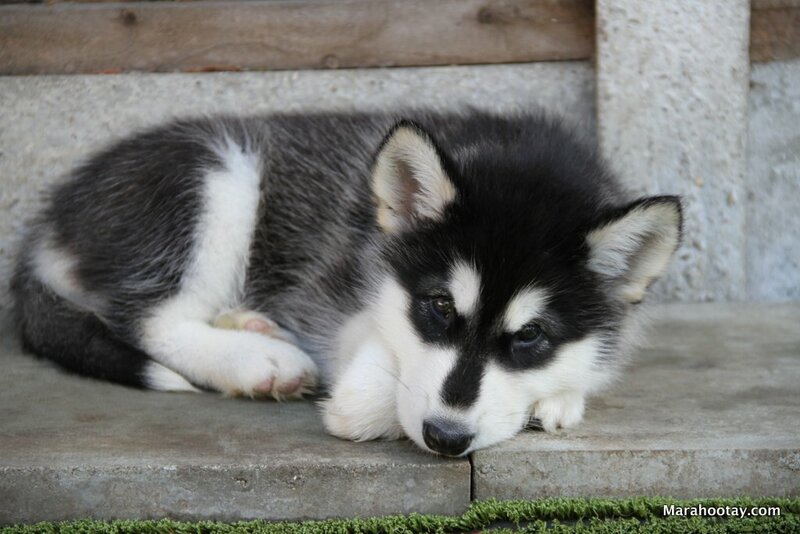 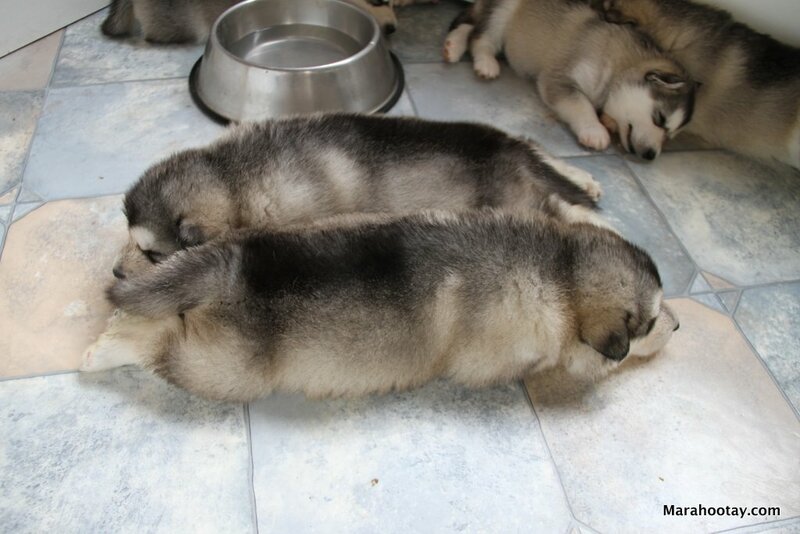 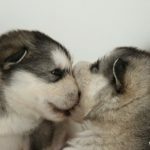 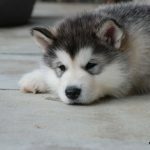 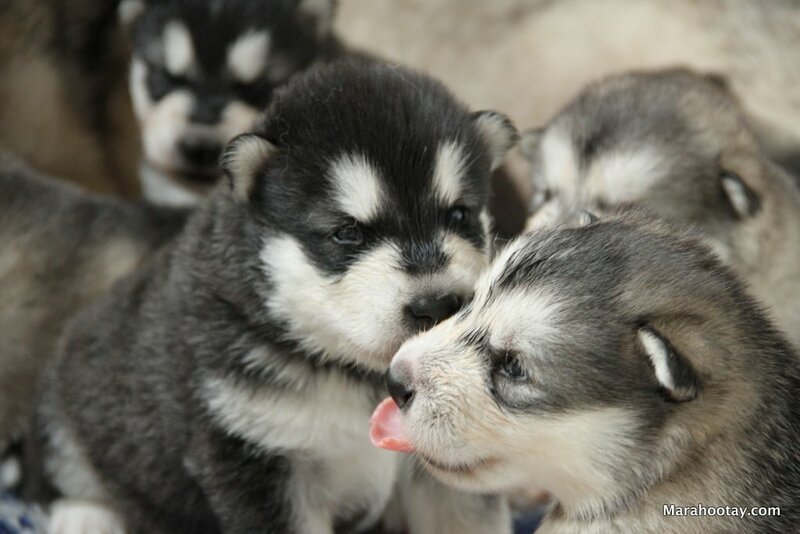 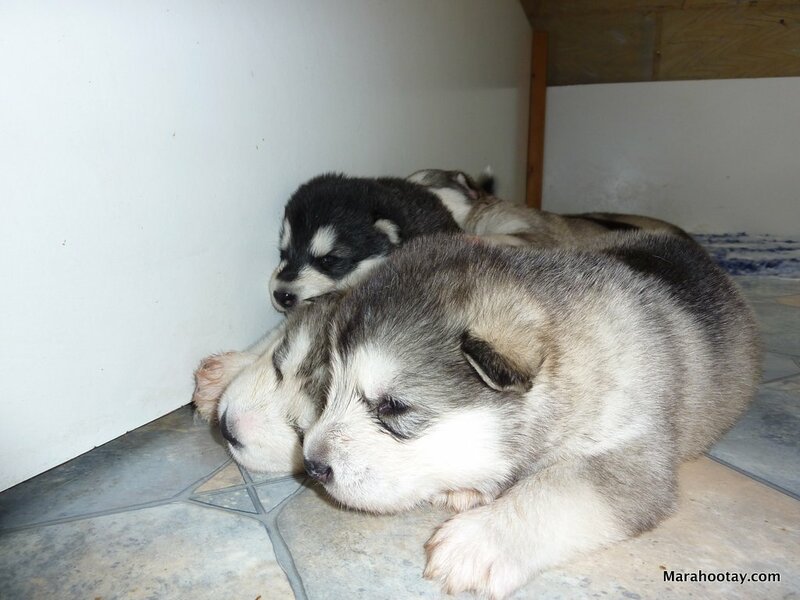 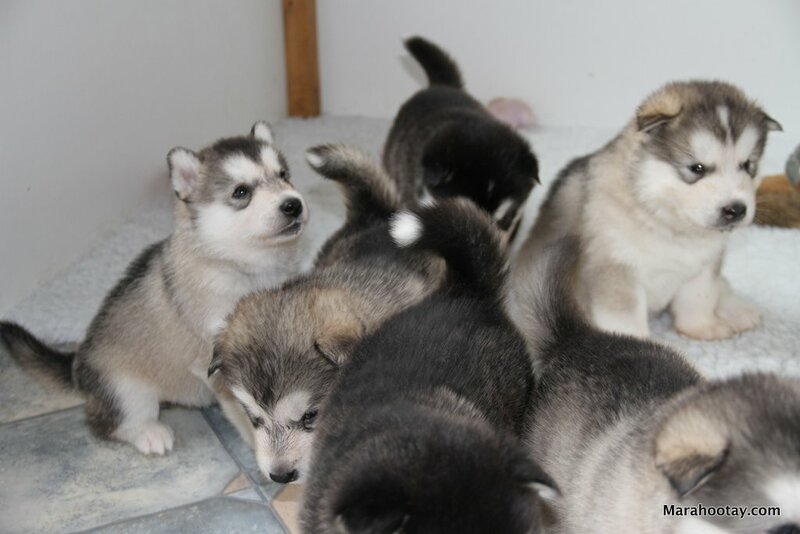 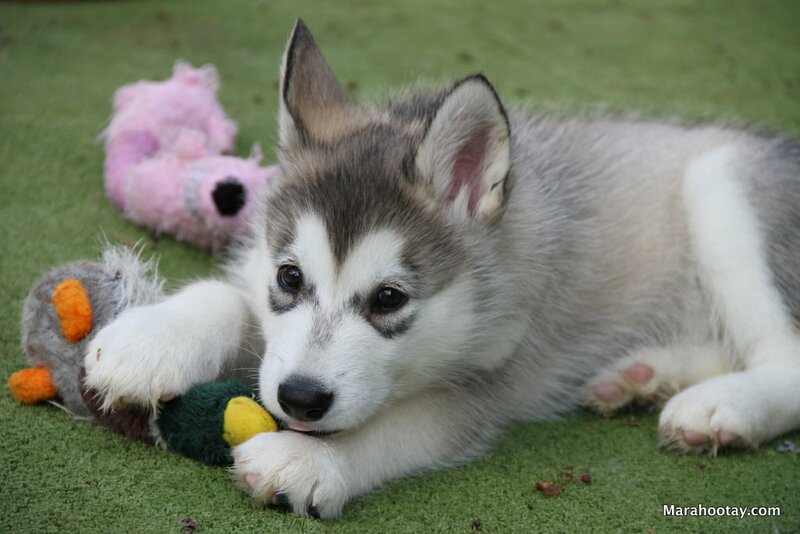 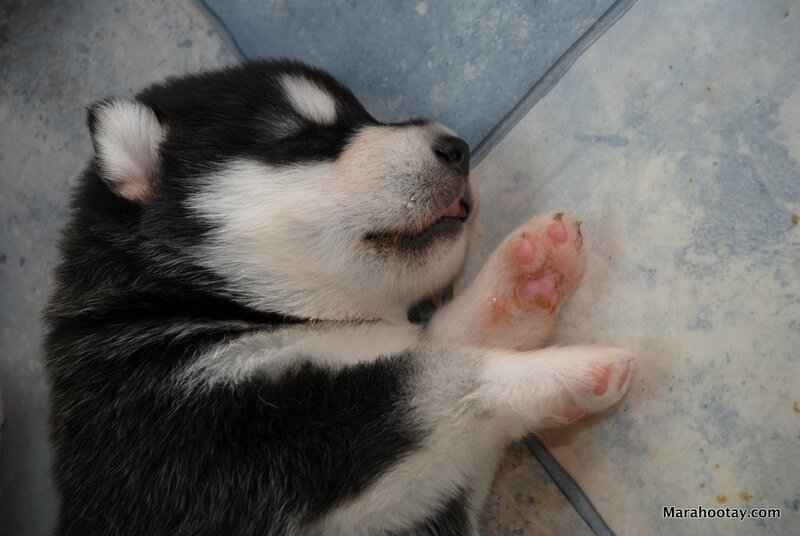 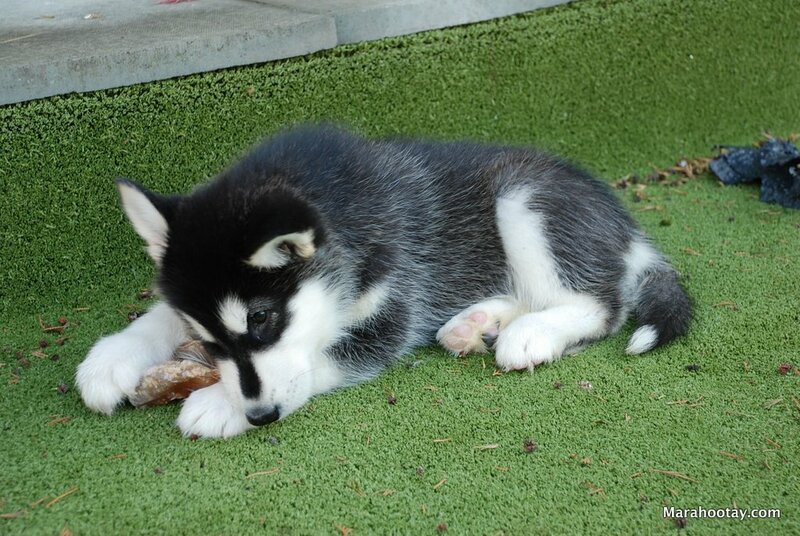 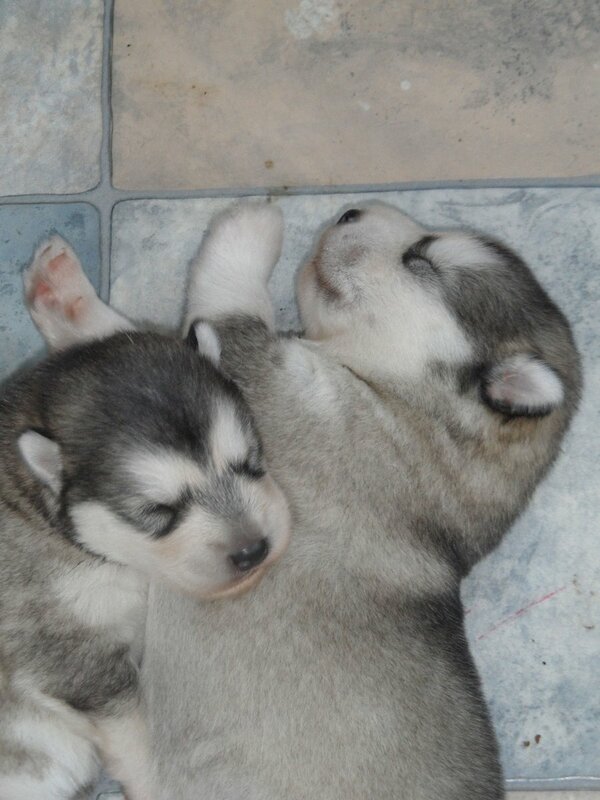 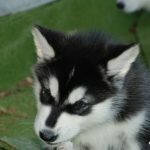 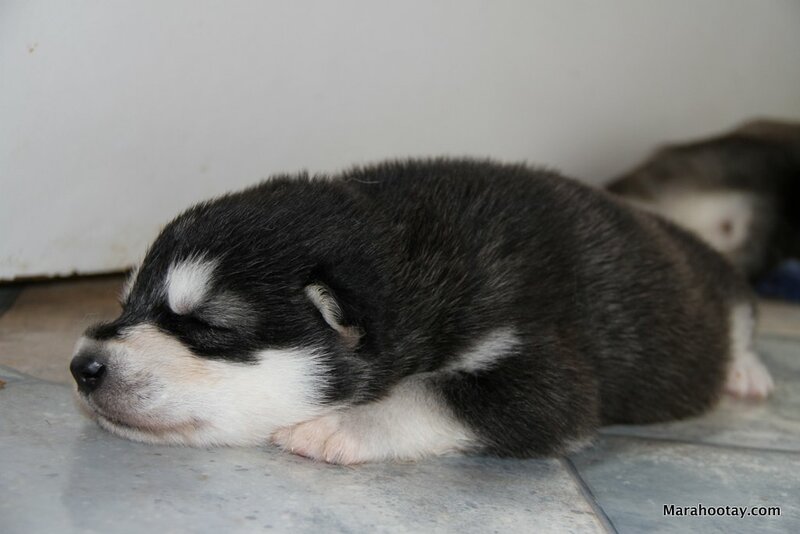 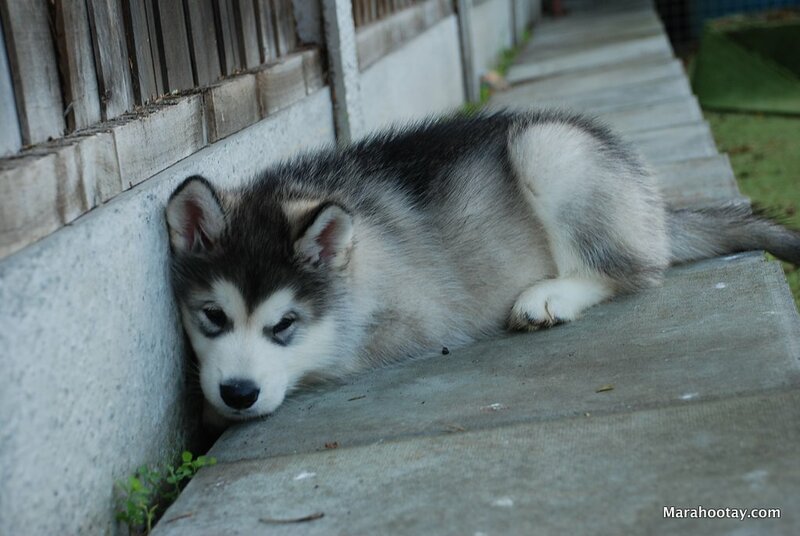 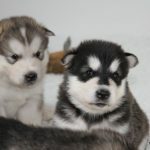 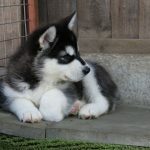 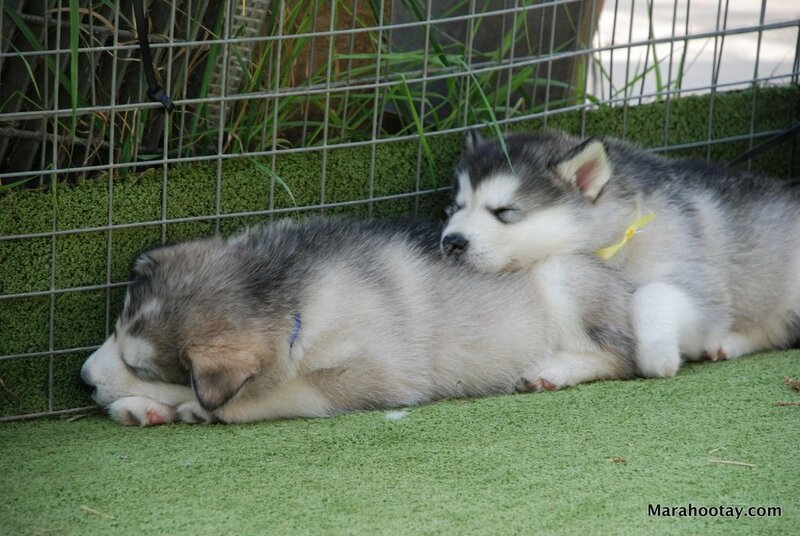 Here are some more pictures of the Hades x Effie 2012 litter … now 4 weeks old. 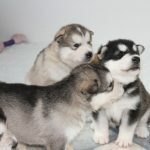 There were some impressive growls from the puppies today during this photo session! 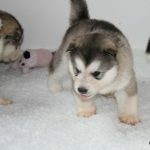 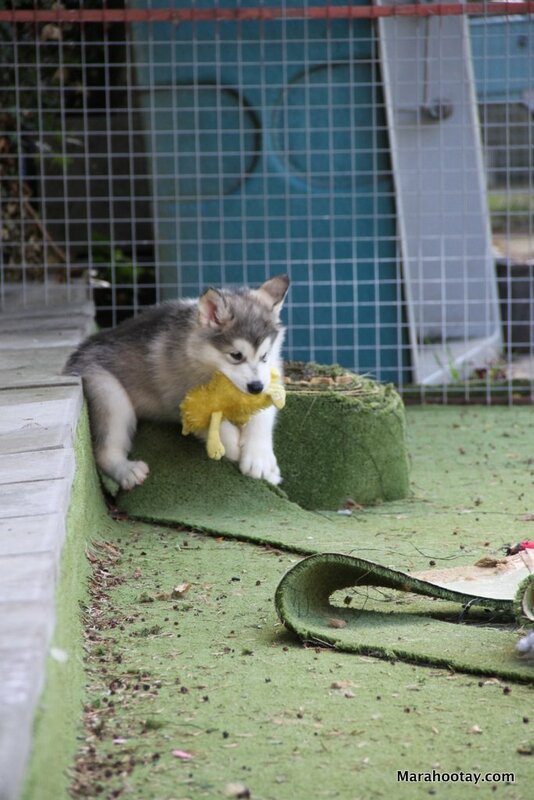 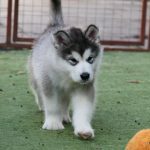 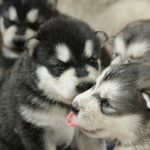 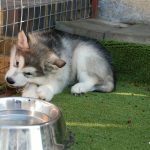 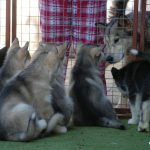 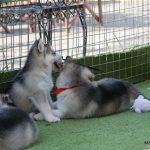 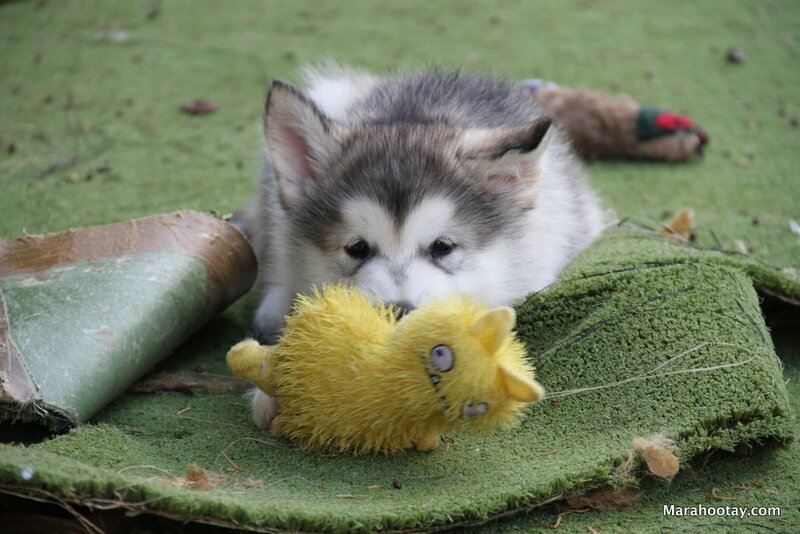 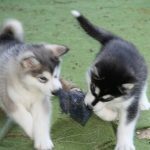 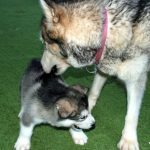 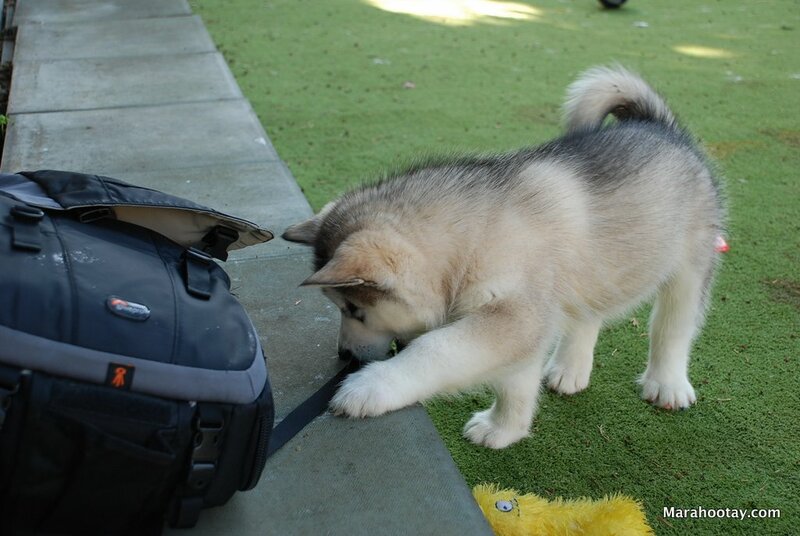 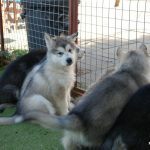 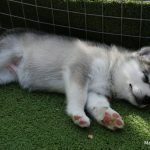 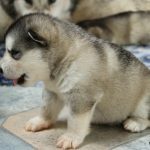 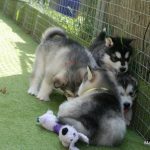 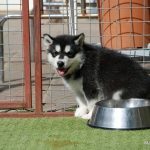 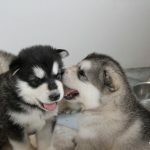 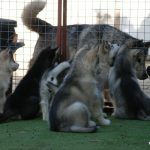 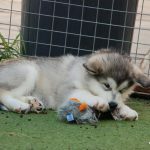 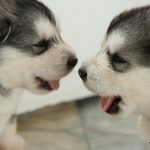 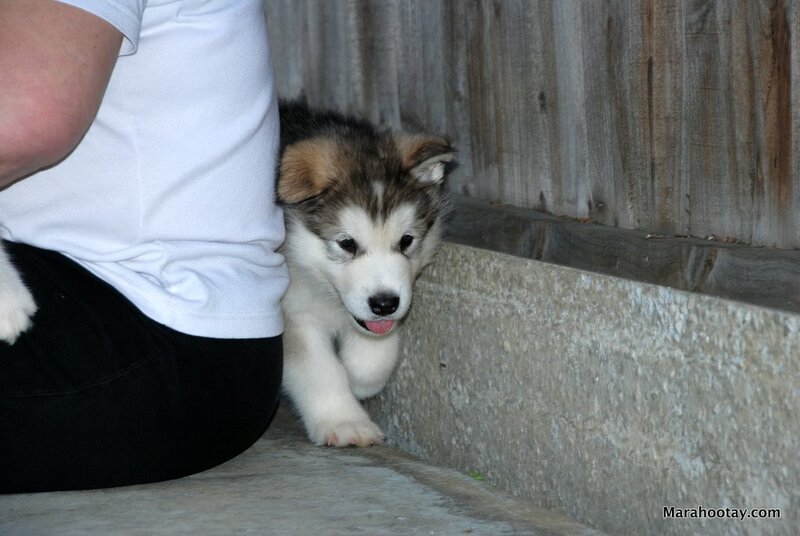 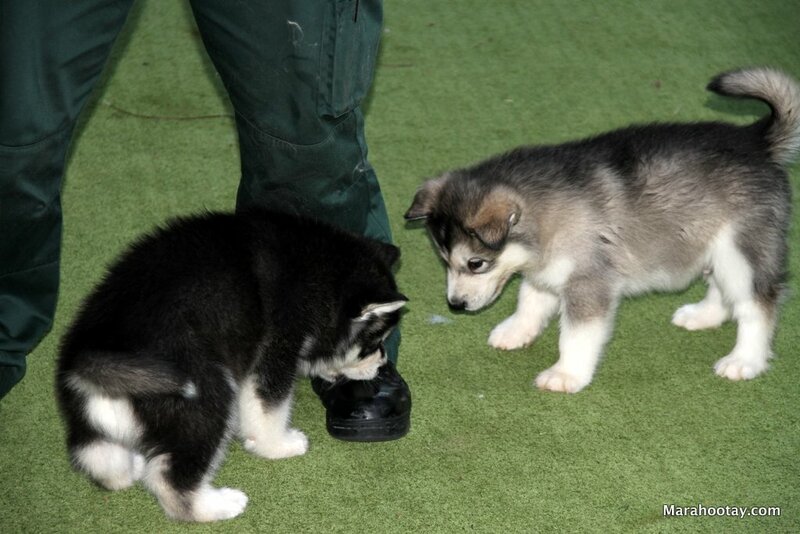 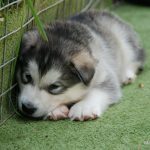 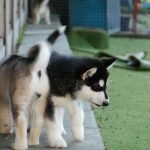 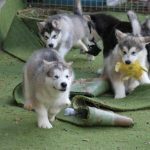 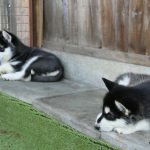 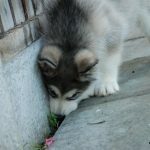 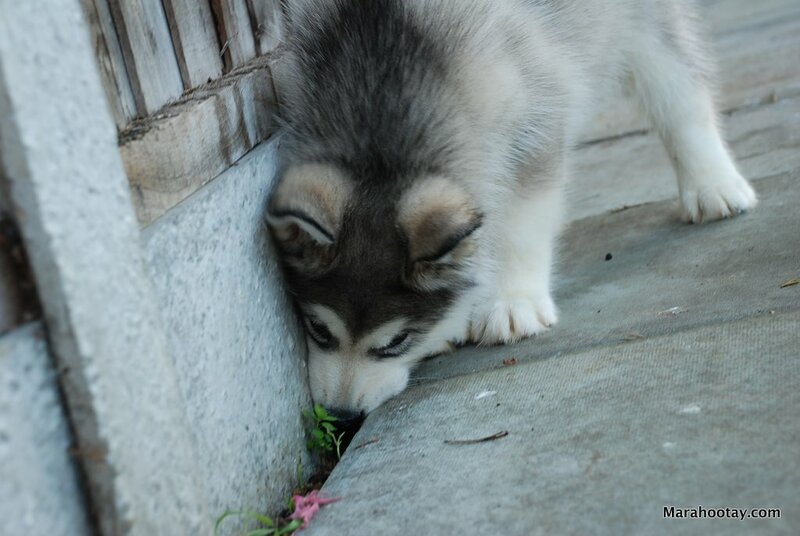 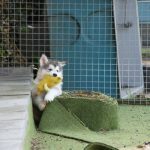 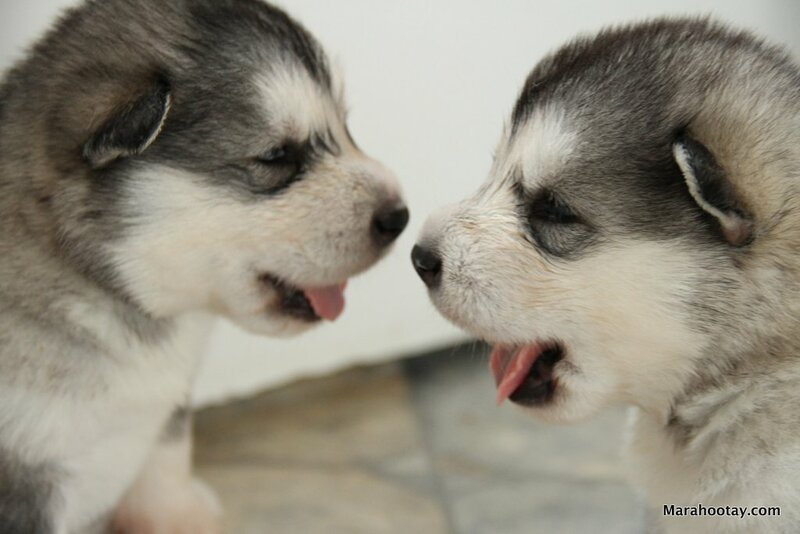 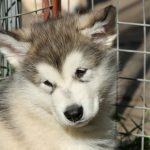 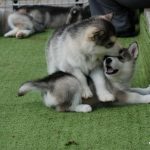 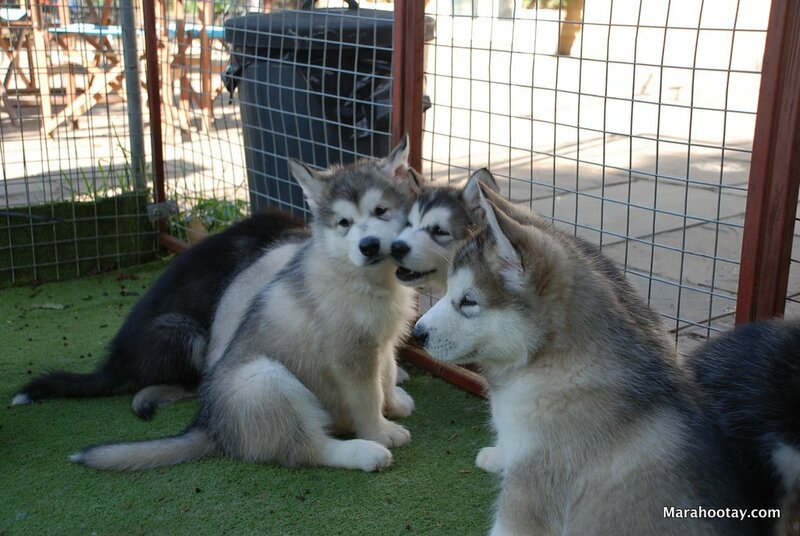 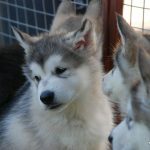 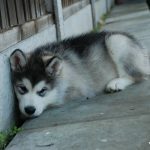 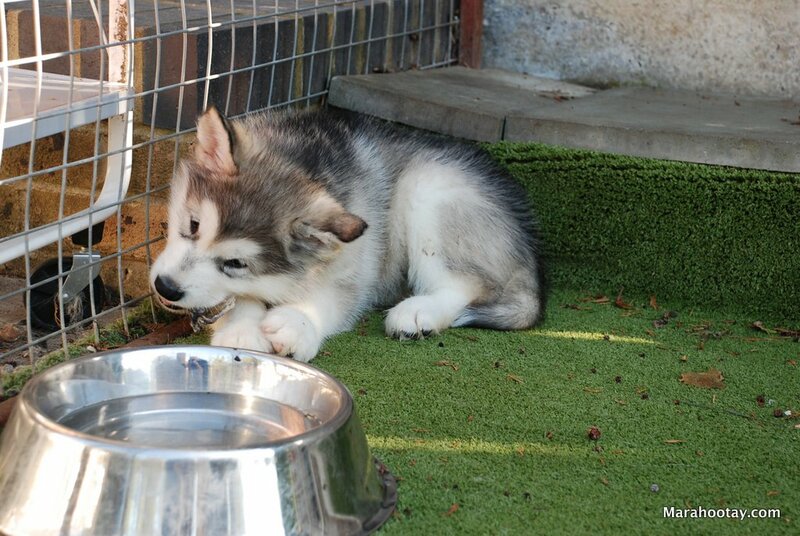 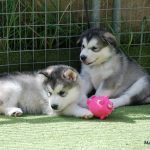 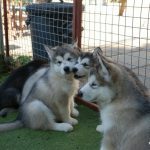 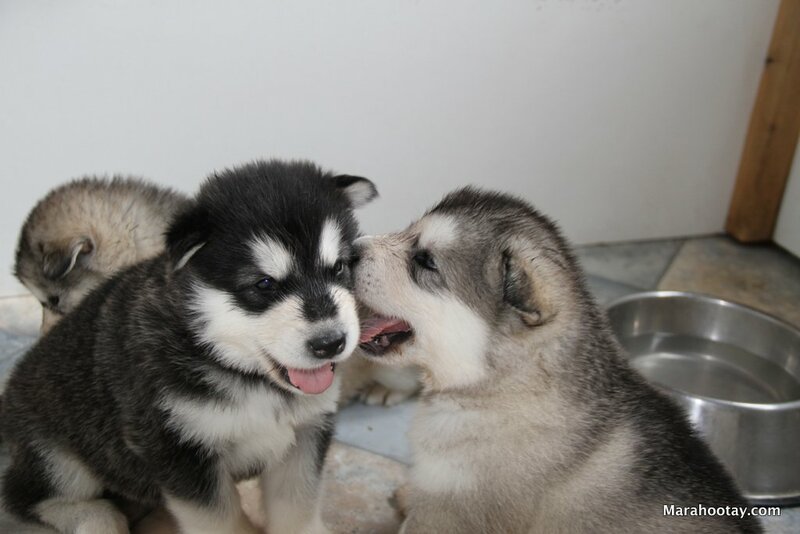 Some of the puppies are managing little howls! 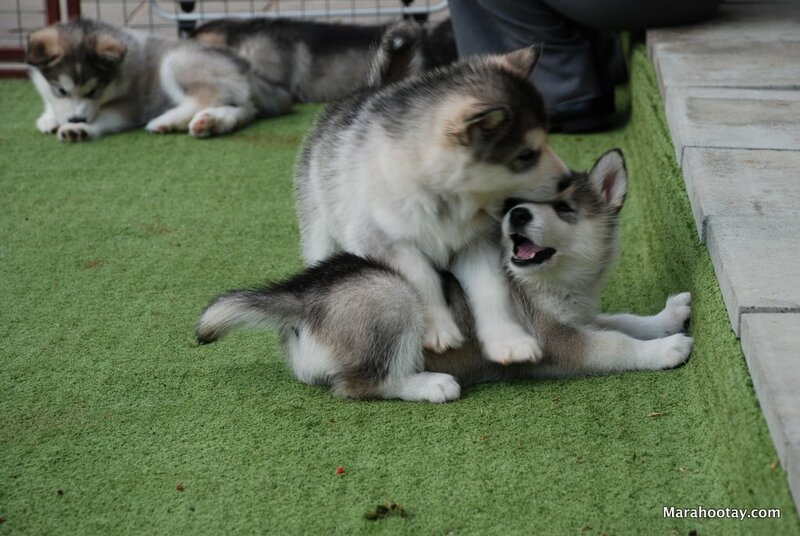 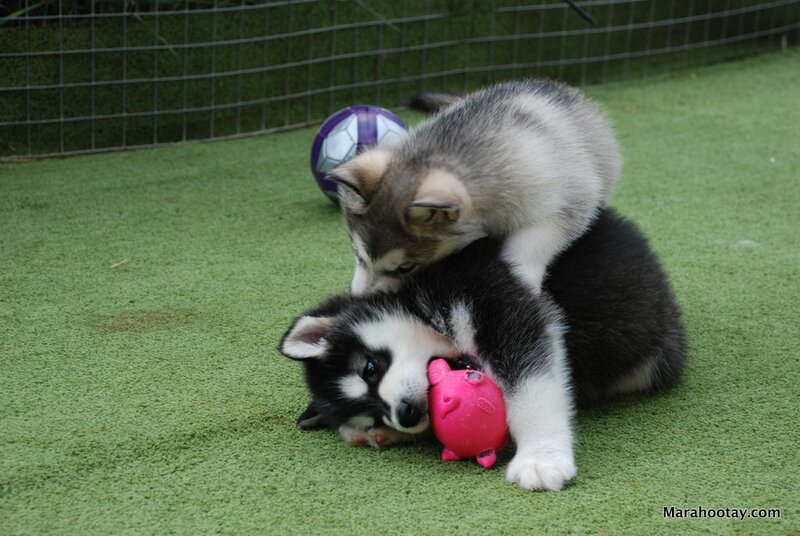 Today we were outside in the sunshine, and the puppies still like to try and exert their dominance over each other. 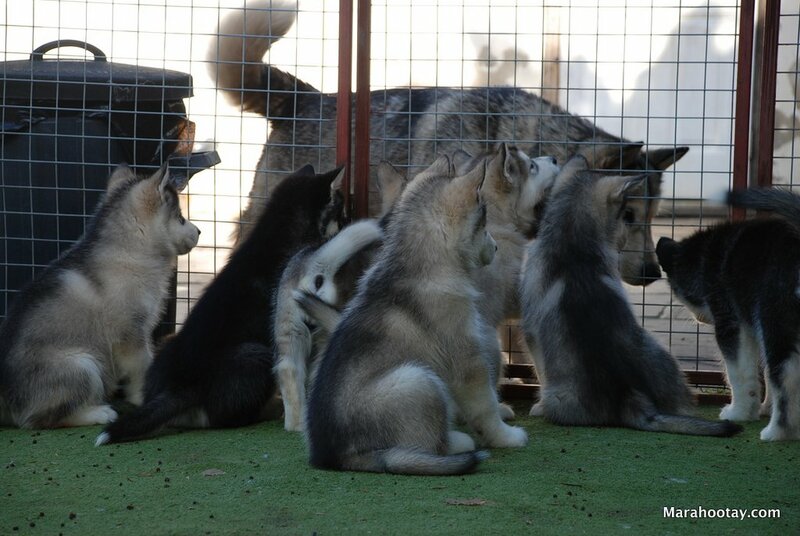 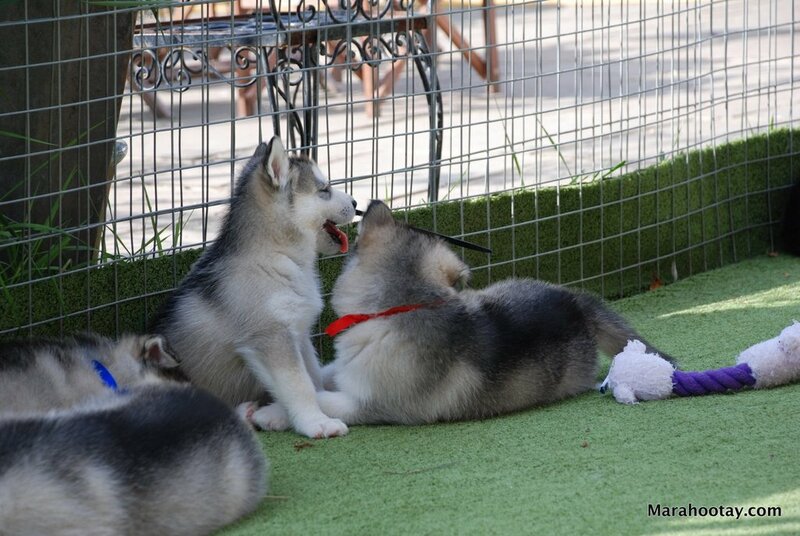 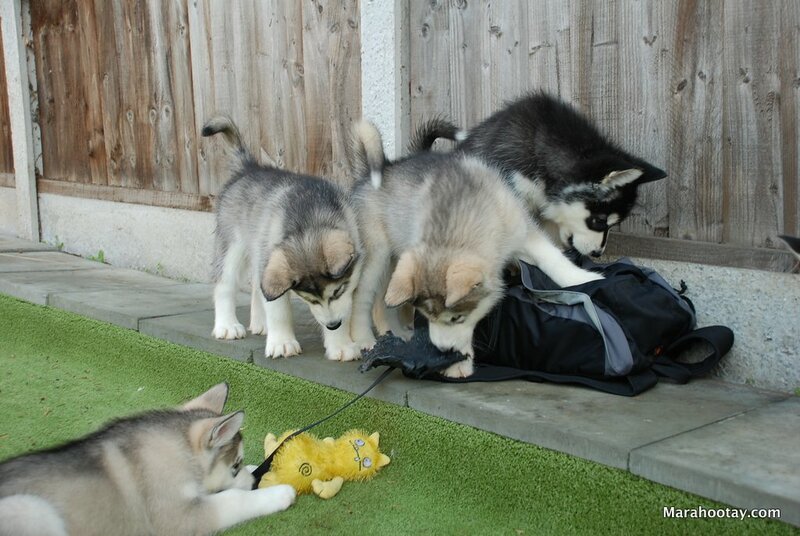 The Marahootay 2012 litter enjoying the sun and developing their ideas about what their teeth are for! 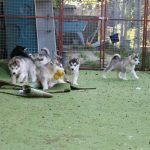 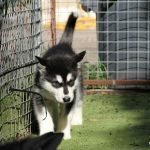 We still have one black/white male puppy from this litter available, if you have a serious enquiry please contact us using the contact form. 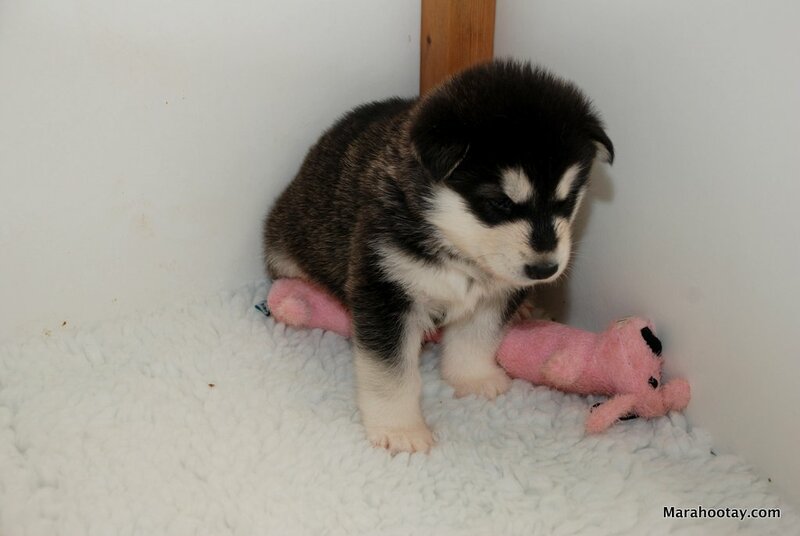 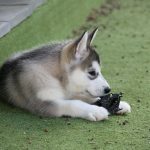 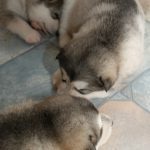 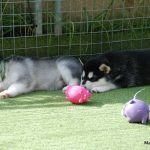 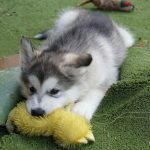 The puppies are now 6 weeks old and finding lots of things to sink their sharp little teeth into! 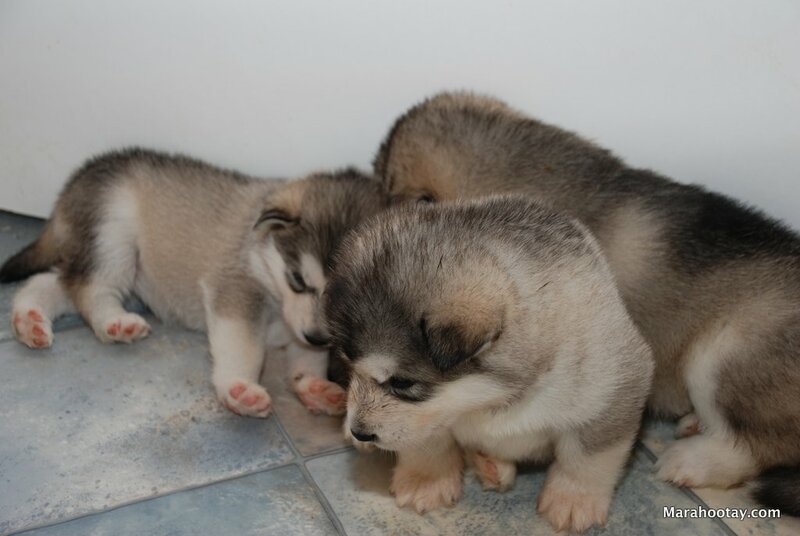 Alas, the puppies will soon be leaving for their new homes. 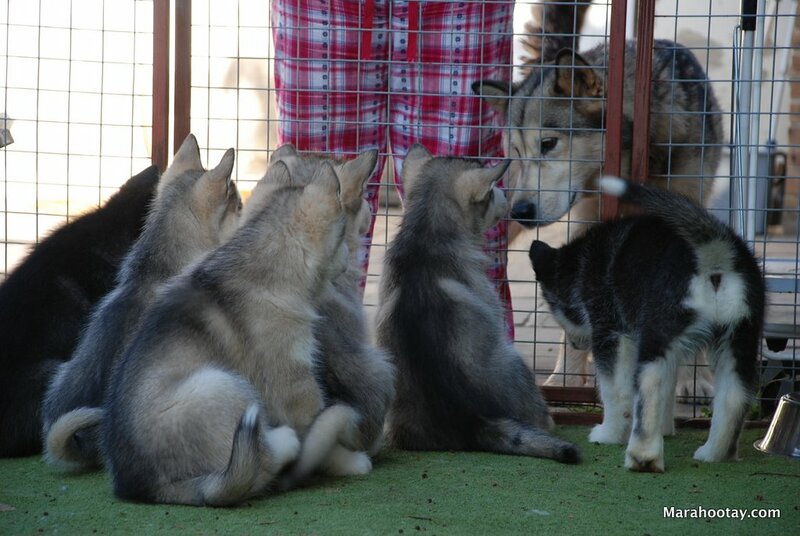 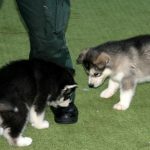 They are certainly growing fast; they have strong back legs with which to jump up at you and sharp litter nippers! 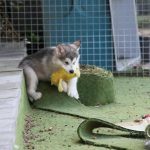 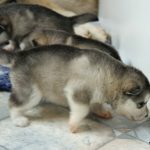 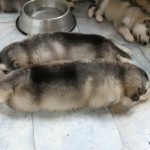 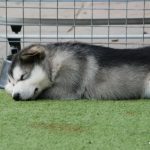 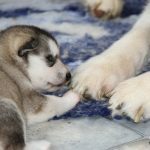 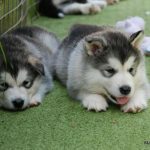 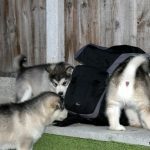 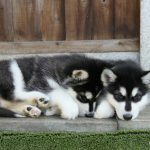 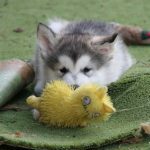 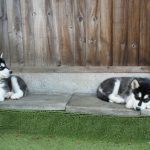 Here we have a bumper crop of photos for you showing the litter doing all the things they should, and a few things they shouldn’t! 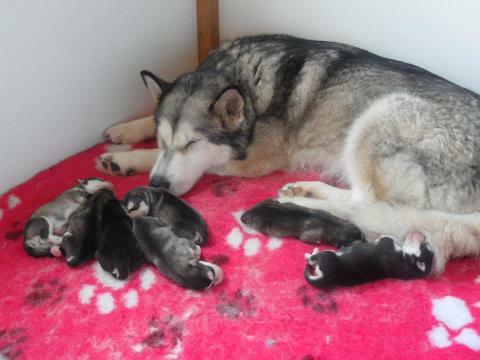 On Monday we celebrated the 3rd birthday of Pink, Sultan, Genie, Alvin, Max, Koda and Miska. 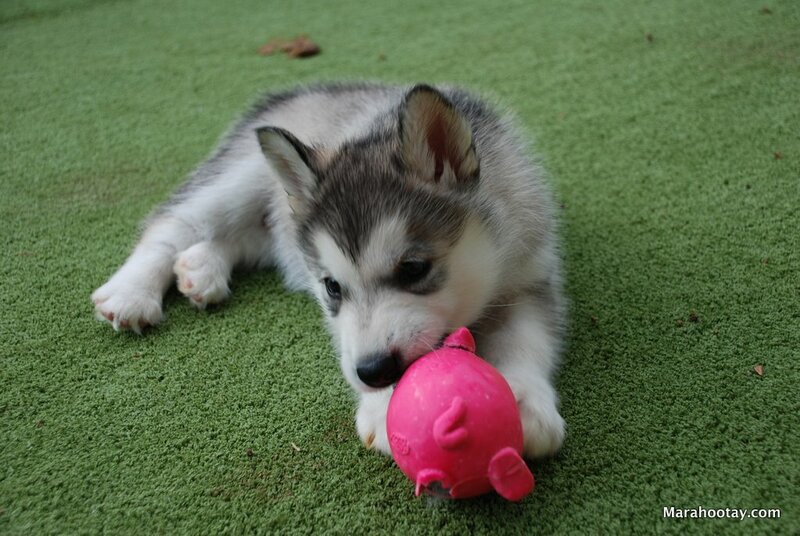 ?Here’s a great photo of Pink sent to us by Angelique.